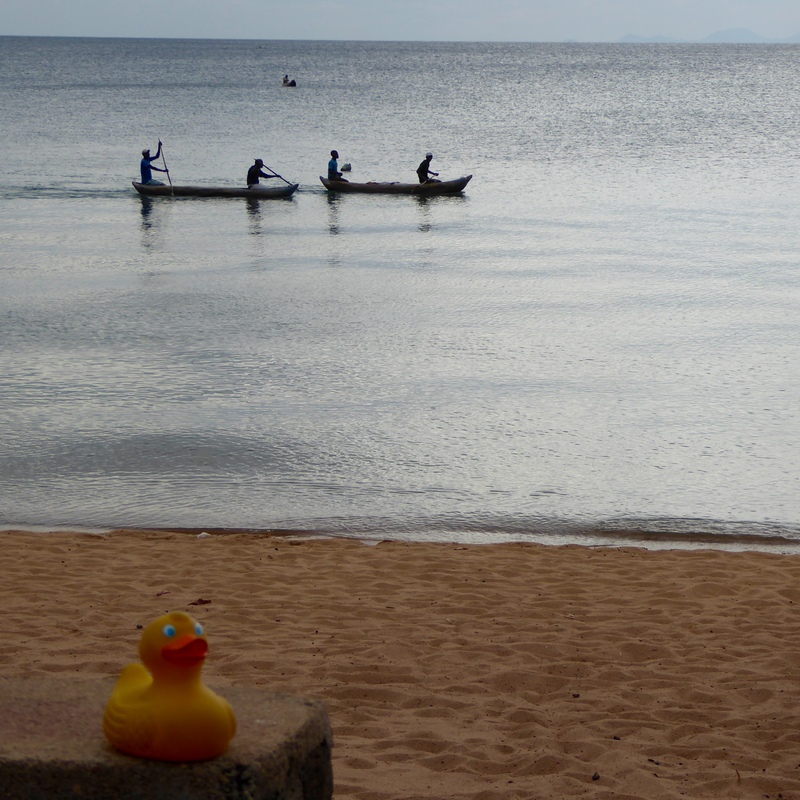 All of our traveling companions have left Malawi now. Mom and I, Zeb the Duck, have one more day here. 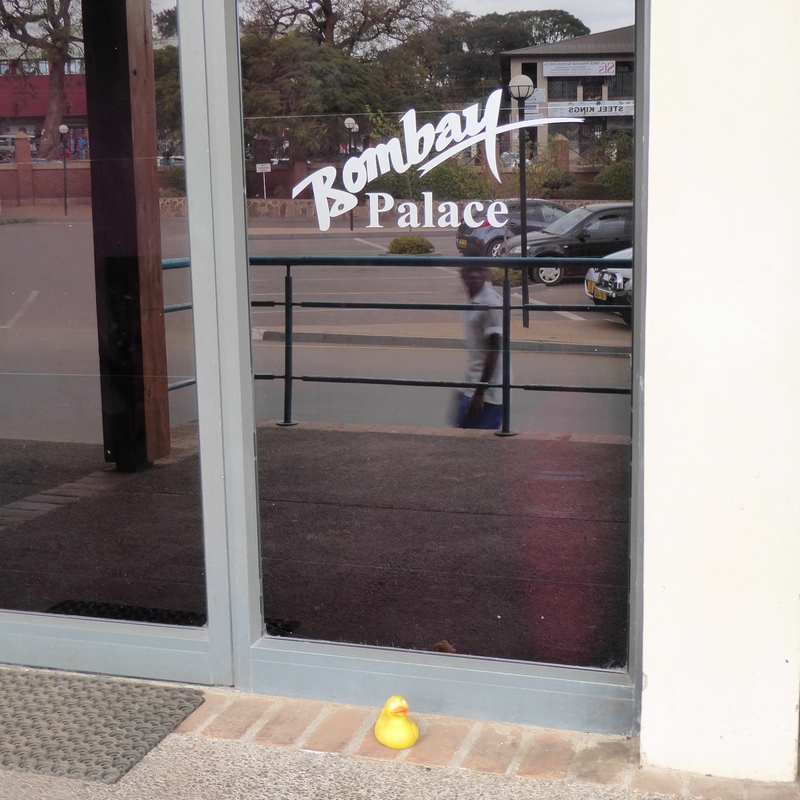 We have been to Lilongwe, the capital of Malawi, a few times, but never for very long. 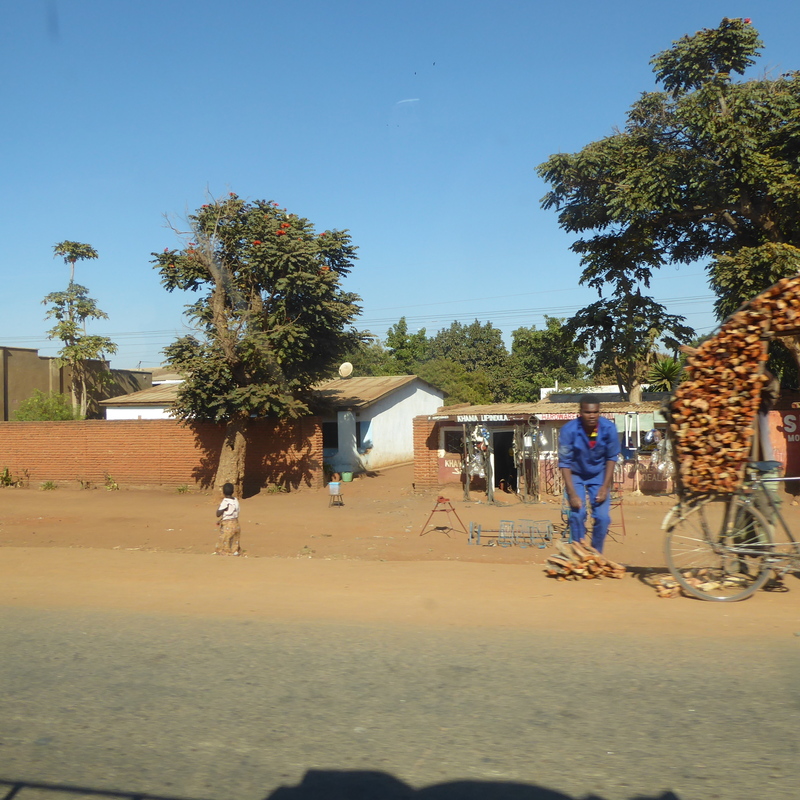 Today I want to show you some of what we saw here, in Lilongwe. 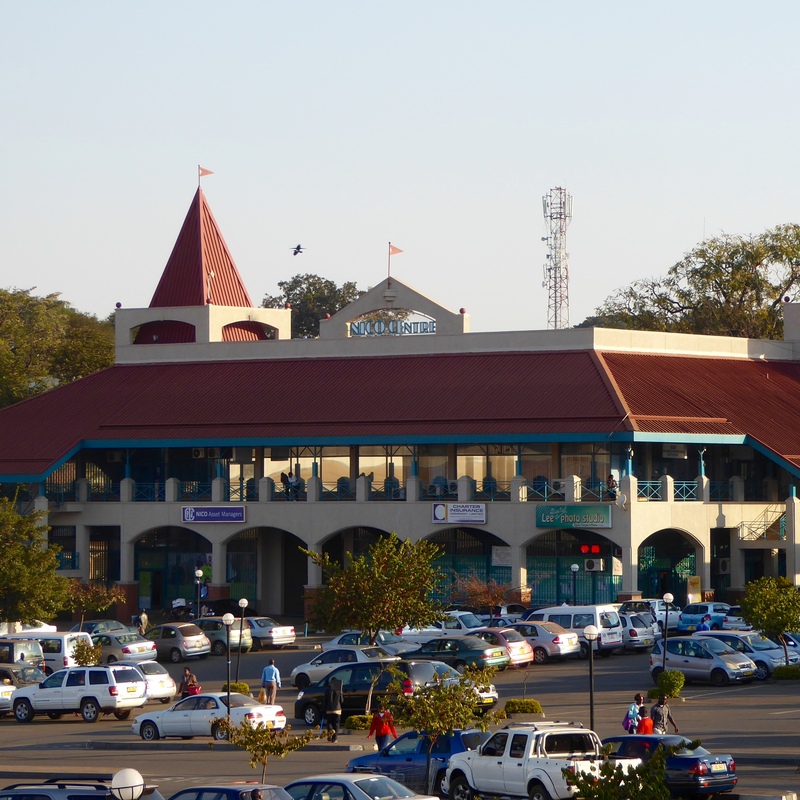 When we first arrived in Malawi, we walked to this shopping center. You can see it is very nice, but not like our shopping malls. There is a Game Store. That is where we purchased sleeping bags for our safari. We did leave the sleeping bags at our hotel so others can use them or they can be sold to help other people. 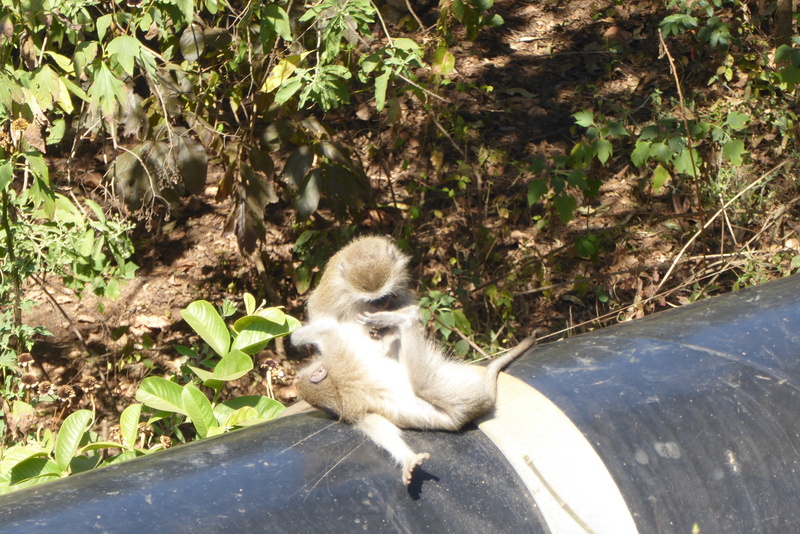 Remember our first trip was to Lilongwe Nature Sanctuary where we hiked and saw some animals. I, Zeb the Duck, like these kinds of taxis. A couple times we had dinner here, at the Bombay Palace. The food was good and the people were nice. 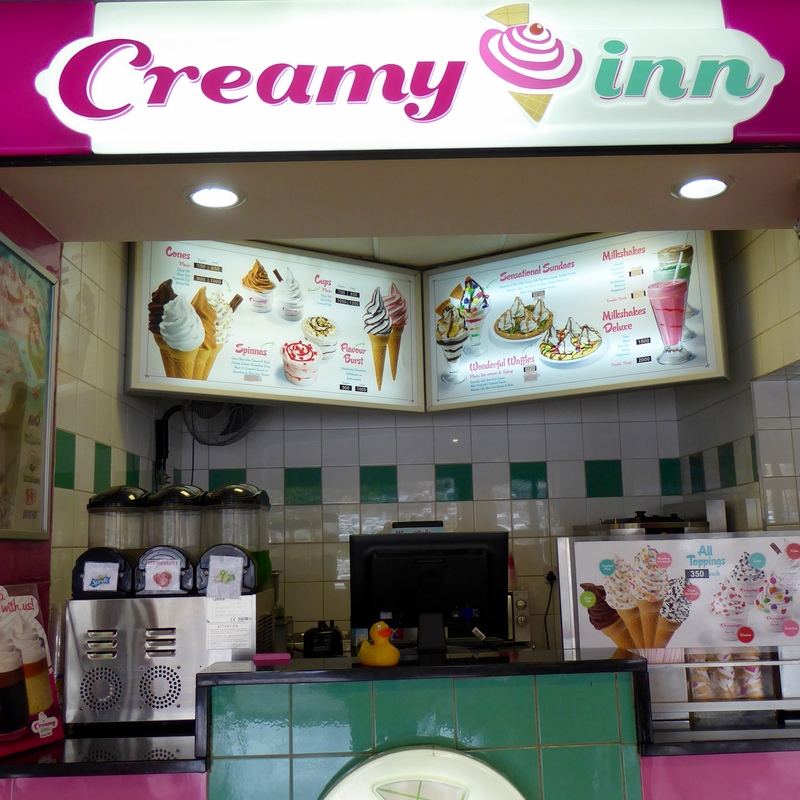 This was a nice dessert stop. 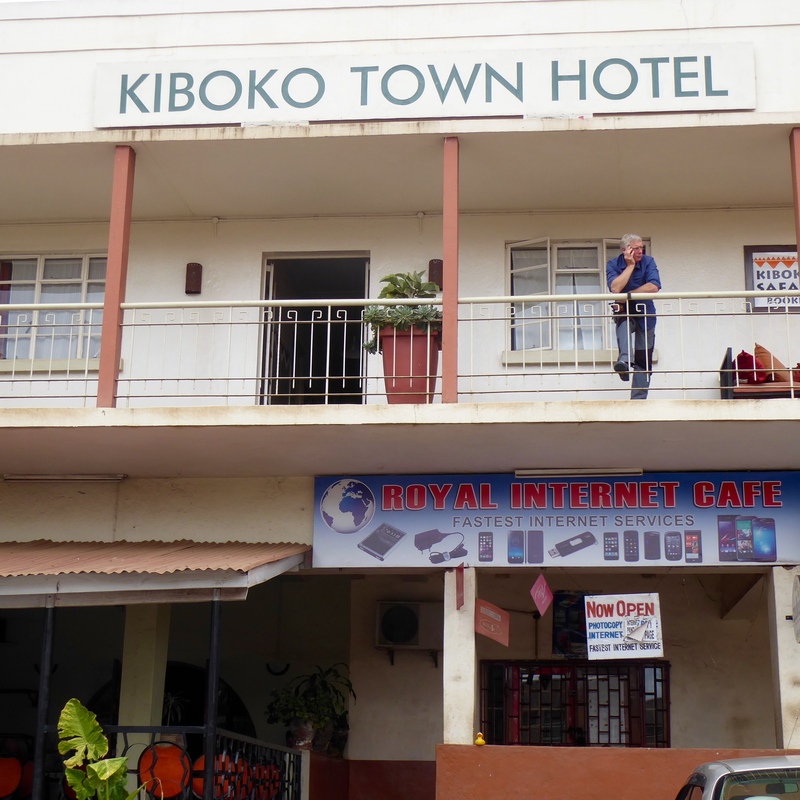 We stayed at the Kiboko Town Hotel in Lilongwe. Again, the people were all so nice and helpful. 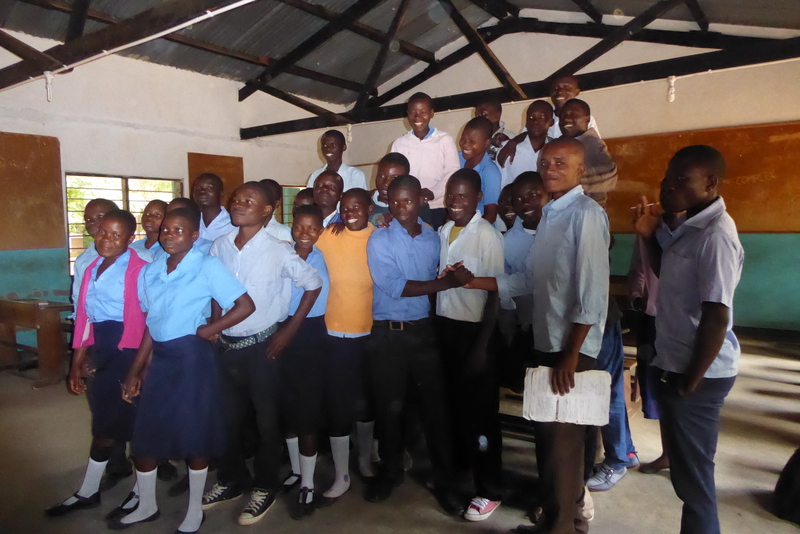 Everyone we met in Malawi was wonderful. We also had dinner here at the Ad Lib Restaurant. 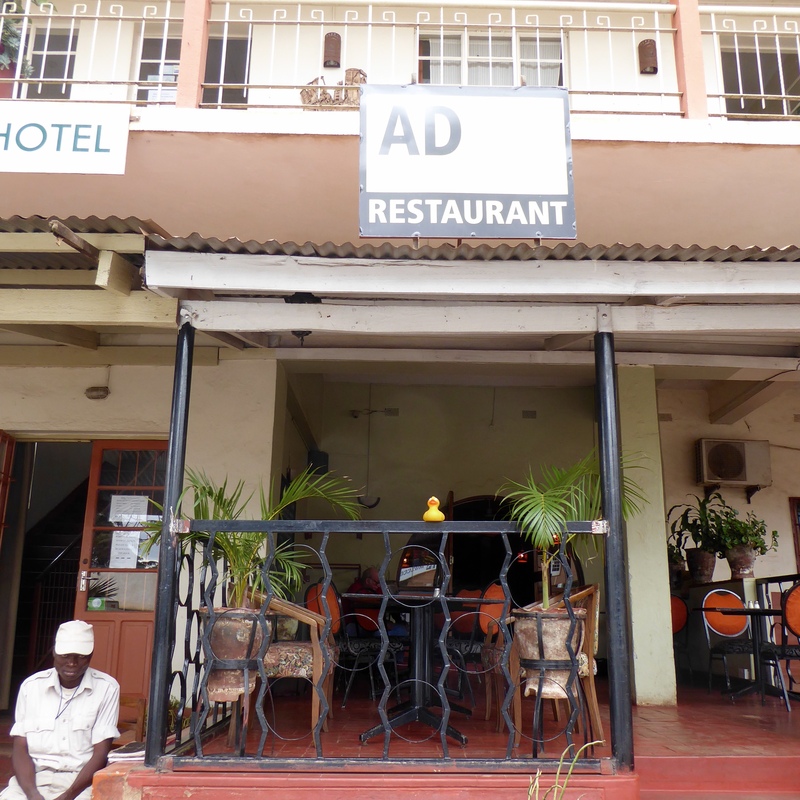 This restaurant is in the hotel building, but they are separate businesses. I admired the huge wood carvings. 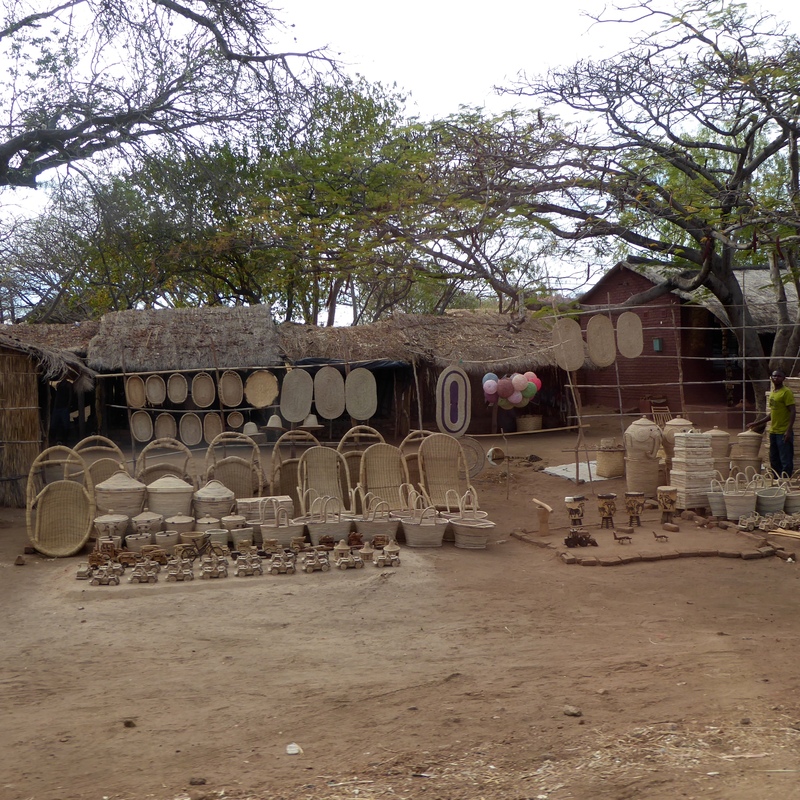 There are many talented artists in Malawi. The craft market was next to our hotel. We all spent a lot of time there. 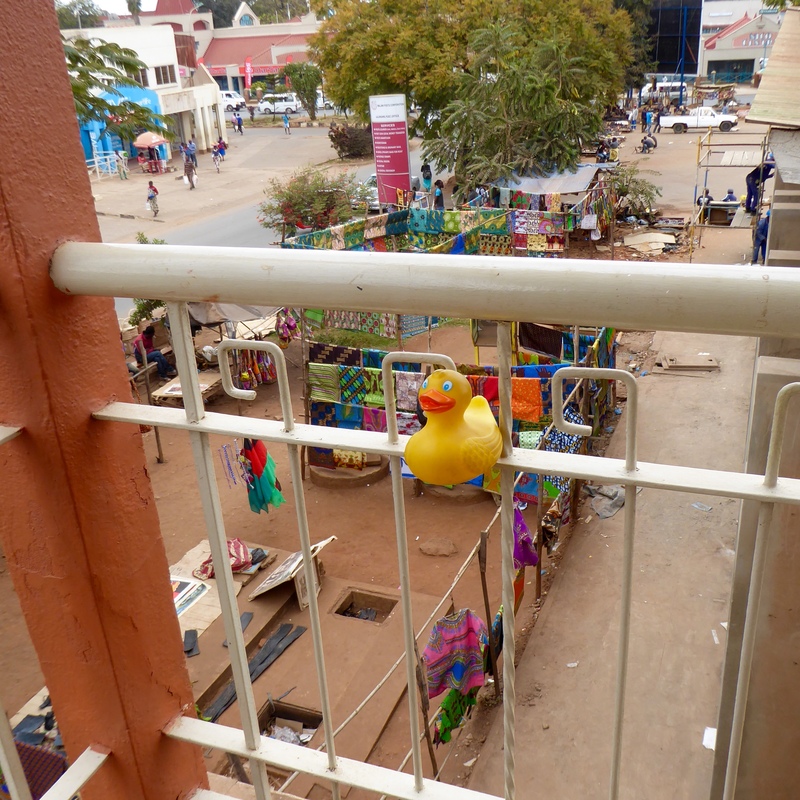 This craft market goes to the end of the street, turns to the right and goes about another block. Many purchases were made, but we felt the prices were very reasonable. And the vendors were very friendly and helpful. If you did not purchase anything from them, they were still nice. Mom and I wandered along different streets, but she did not take many photos. 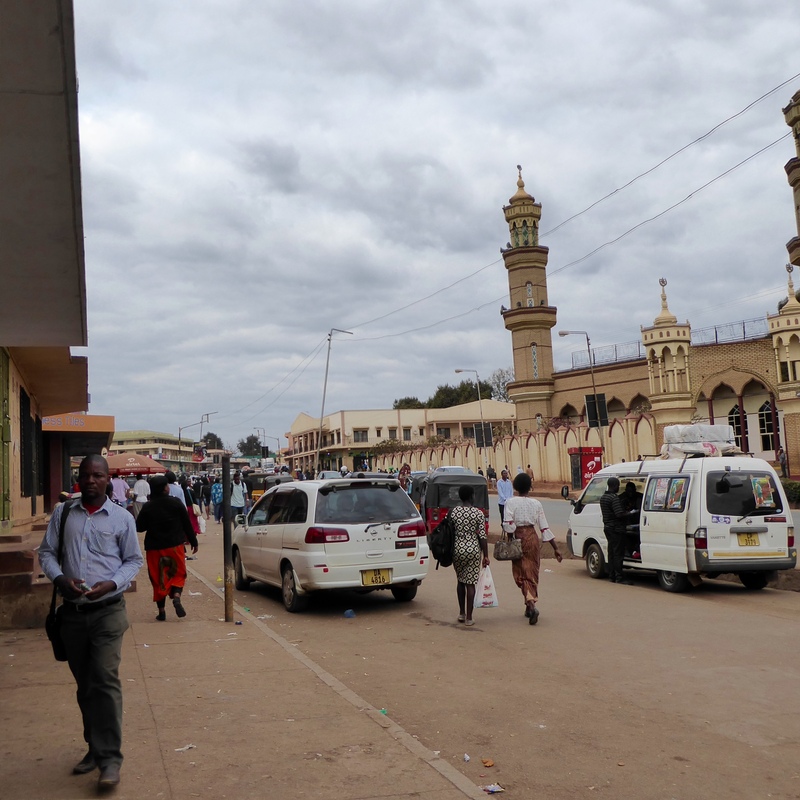 This is one street photo including a mosque. People from many countries and of many religions seem to get along well with each other. We did not see any arguments. 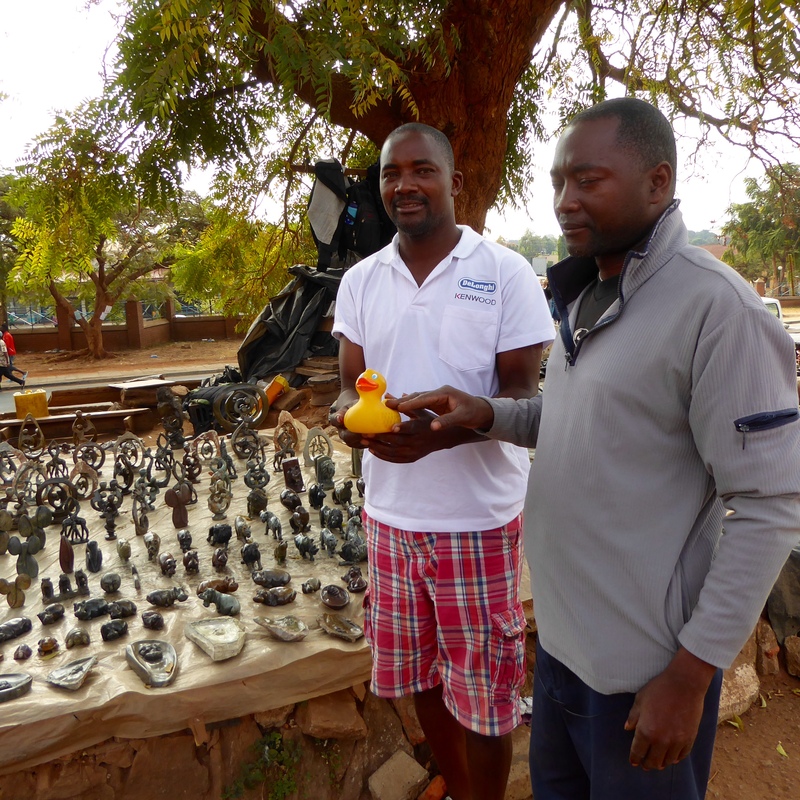 Back to the craft market by our hotel, these friendly vendors were our friends. Of course we did purchase some souvenirs. 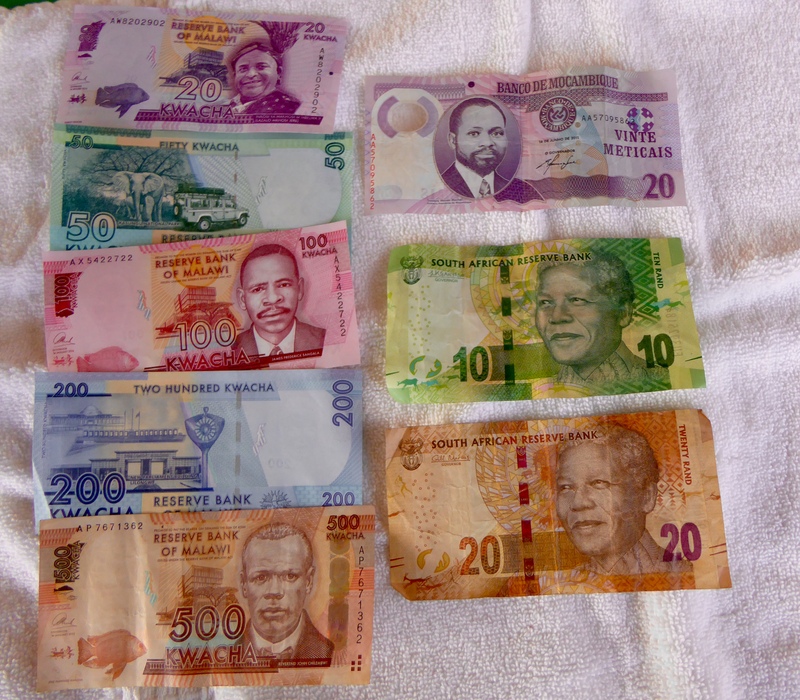 Mom said we have more countries to visit, so we can only purchase a few small things at each market. The suitcase will not hold too much. 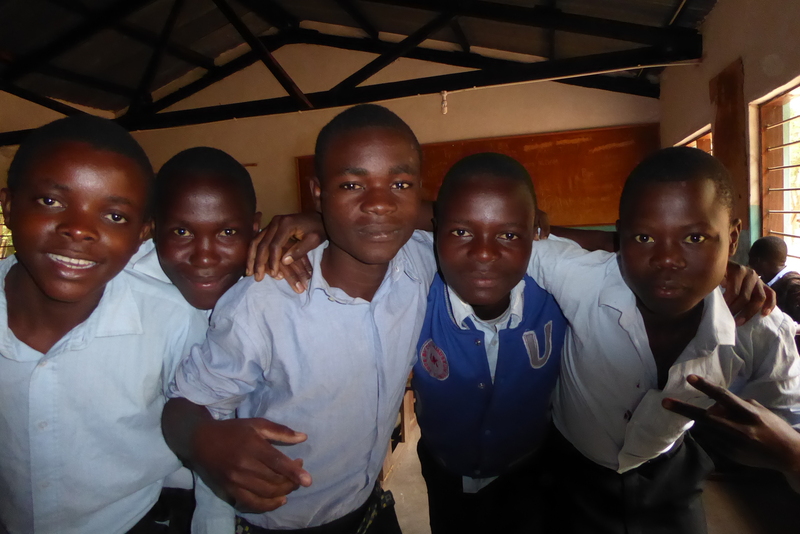 We want you know that all the people we met in Malawi were so nice and so willing to share with each other. Everyone had smiles. But, life here is difficult. 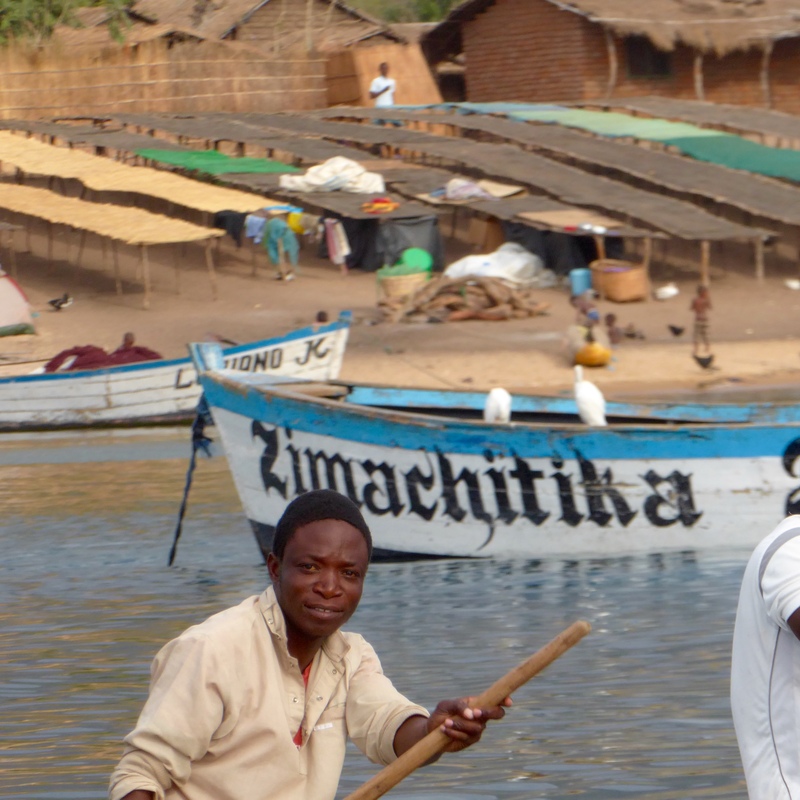 This is one of the poorest countries in Africa. The malaria rate is high. Many people get cholera. The HIV rate is also very high. Even finishing elementary school is not common. 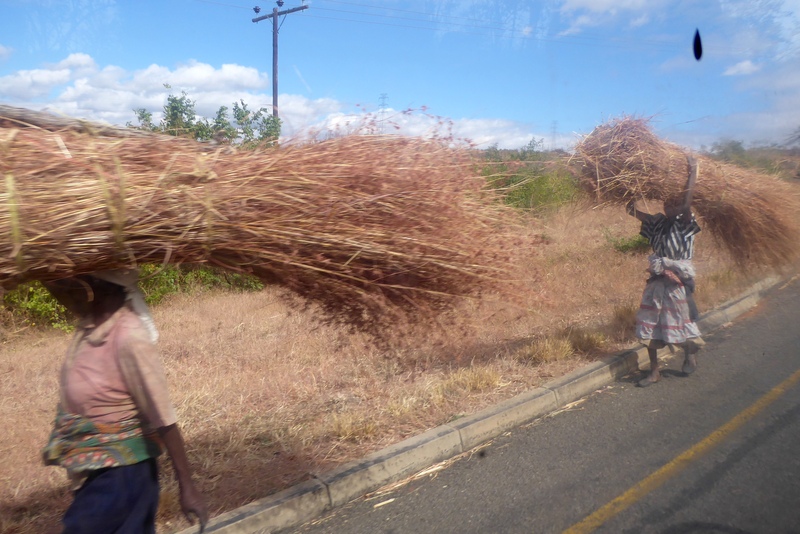 You may have heard that southern Africa is enduring another drought and many organizations predict millions will die of starvation. These are the faces of youth we met. All eager and wanting to learn so much. 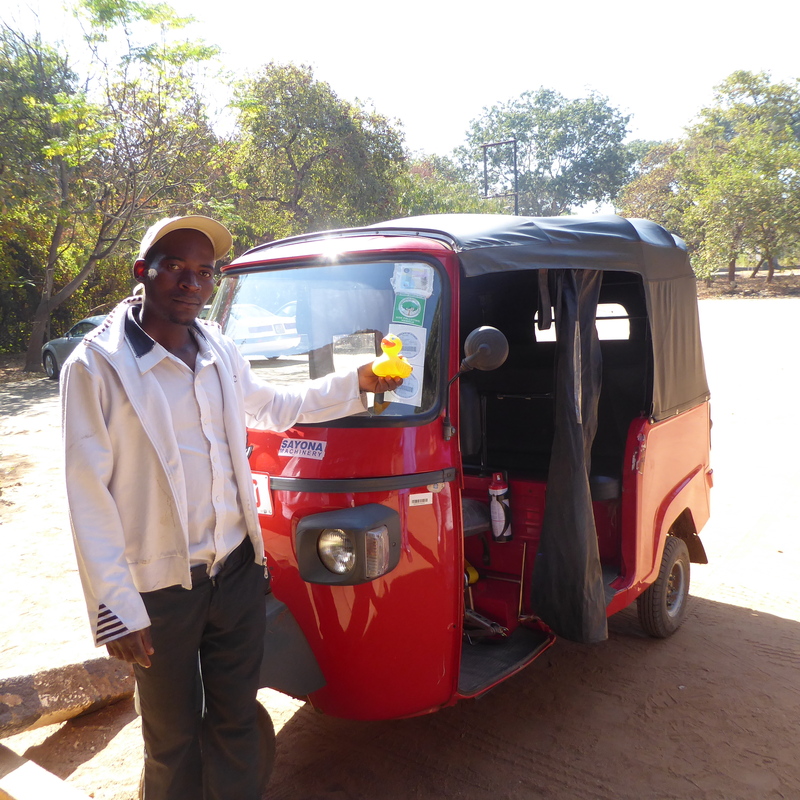 If you have a favorite charity, perhaps you can give a donation for Malawi and other southern African countries. Some of our favorite charities are Women for Women. 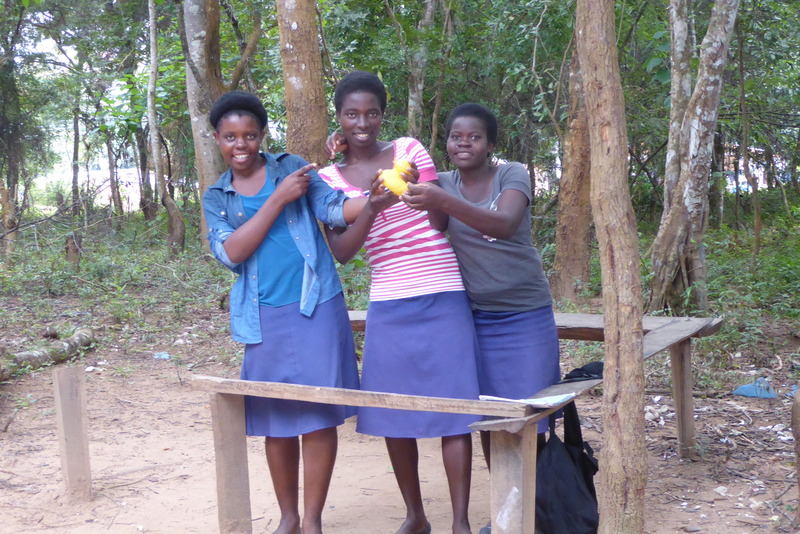 This charity often gives small loans to help women start businesses. Perhaps $25 to sew items to sell. They have a very high success rate and the loan repayment rate is also very high. 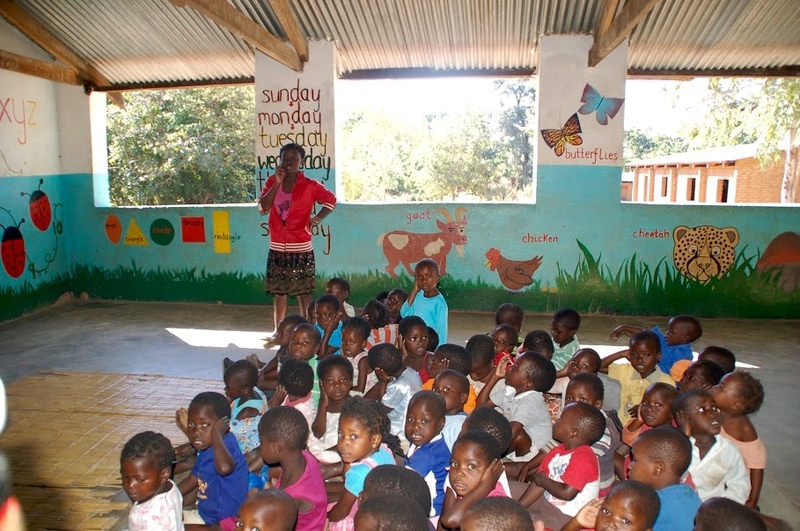 Heifer International gives a few goats or other animals, perhaps chickens and teaches how to use milk, eggs etc for themselves, sell the extra and let the animals reproduce. 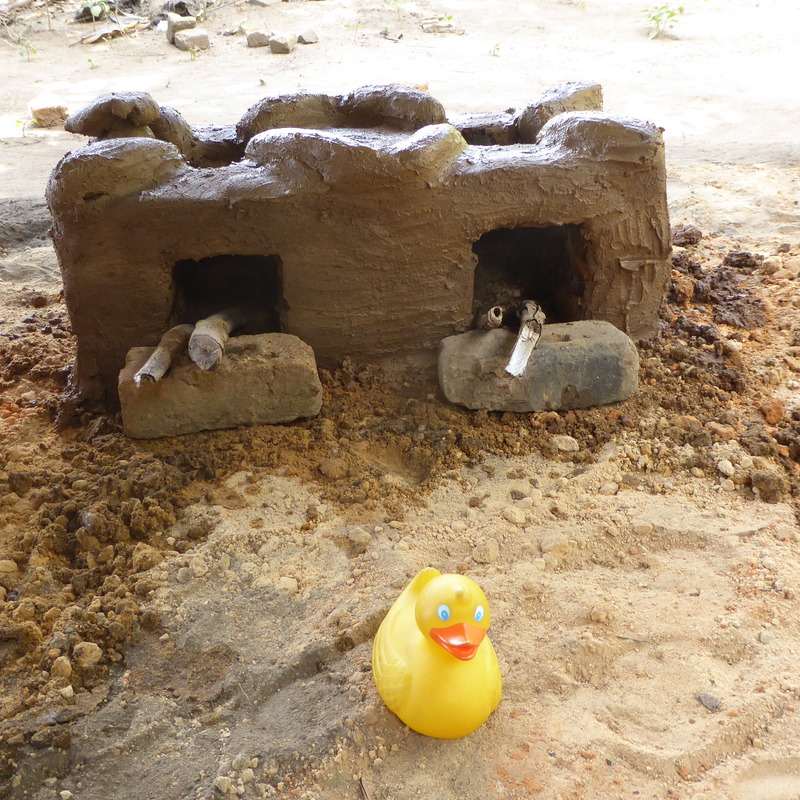 Then the new animals are given to another family or village to continue the process. 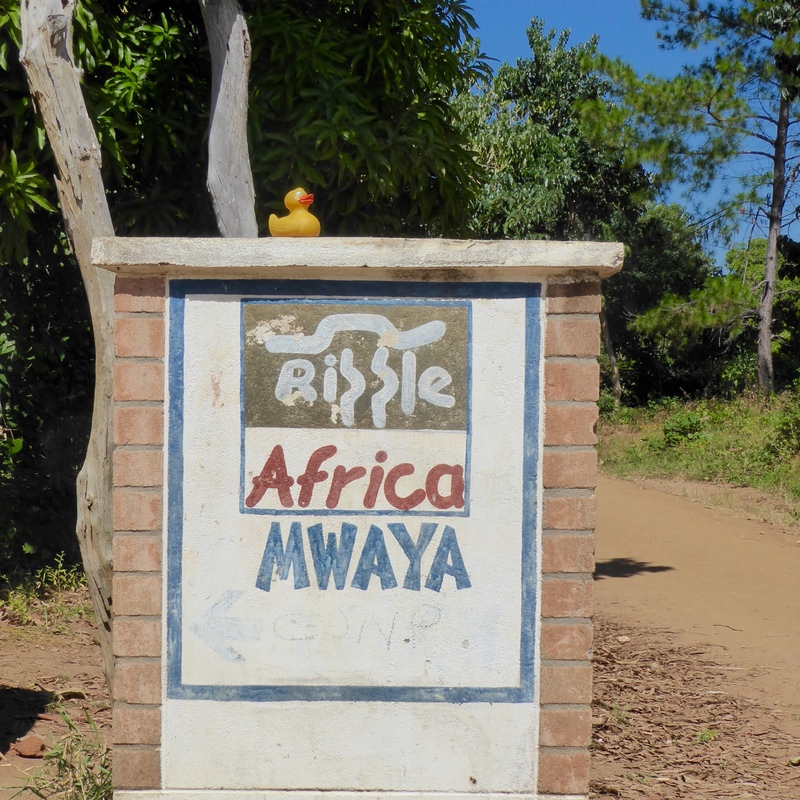 Of course, Ripple Africa is the organization where we volunteered for a couple weeks. You have seen some of the good that they do. 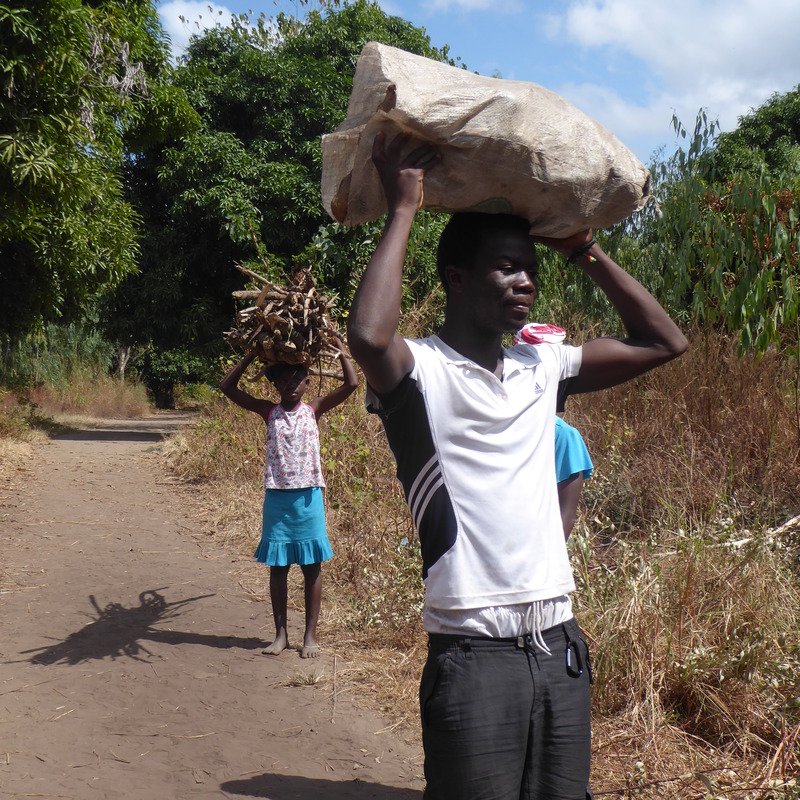 And, World Food Program, connected with the United Nations, does get food to many that need it. We usually do not get this serious in our blogs, but we hope you can help these people. 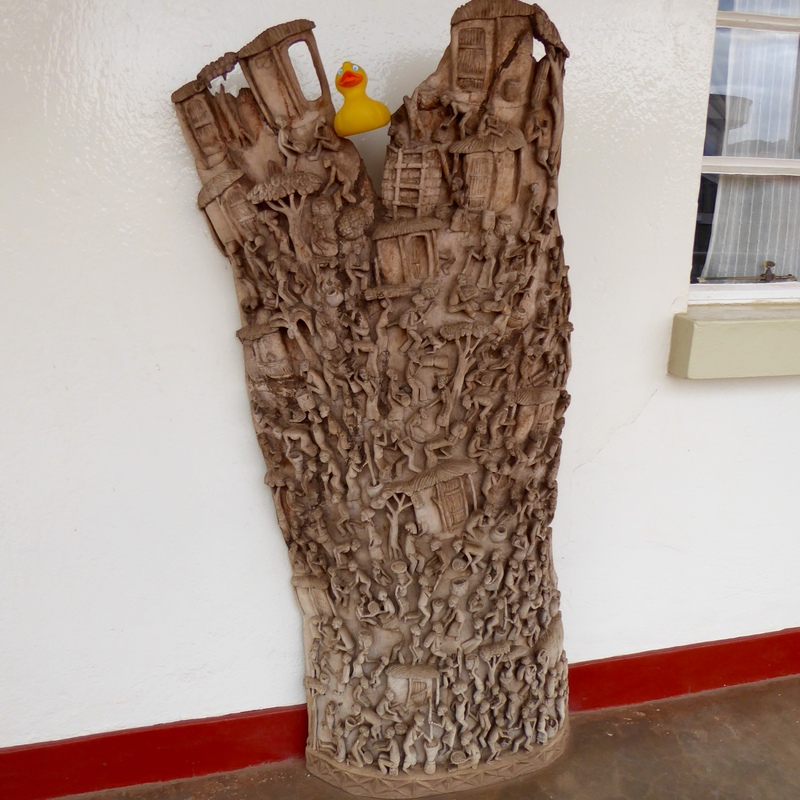 If you donate through a church or a favorite charity, the people of southern Africa and the Colorado Traveling Ducks thank you. 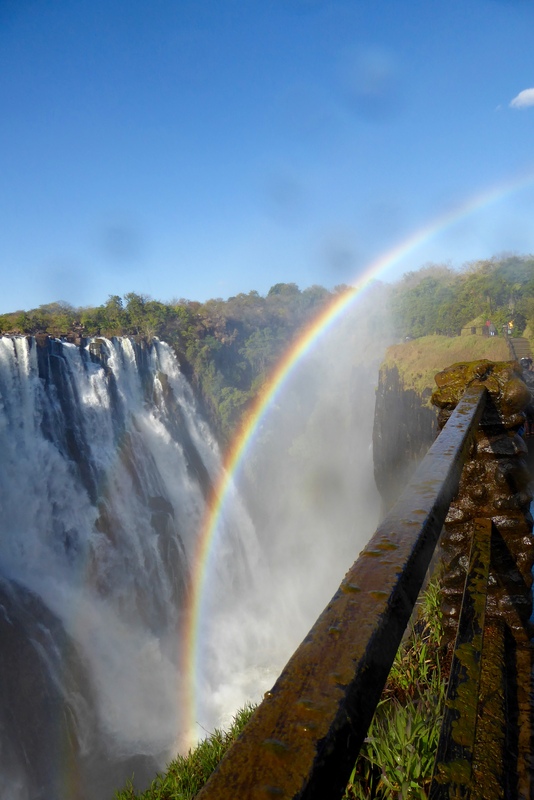 Next time we will show you our first day in Victoria Falls, Zimbabwe. 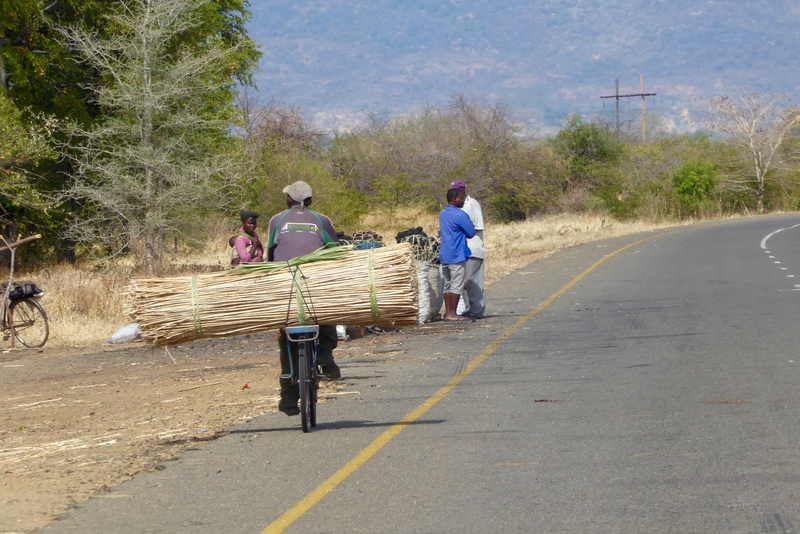 Leaving Cape Maclear, we saw many people on the road. This man, carrying such a big load on his bike, fascinated me. And look at these women. They can carry so much and such heavy loads on their heads. Aren’t they amazing? 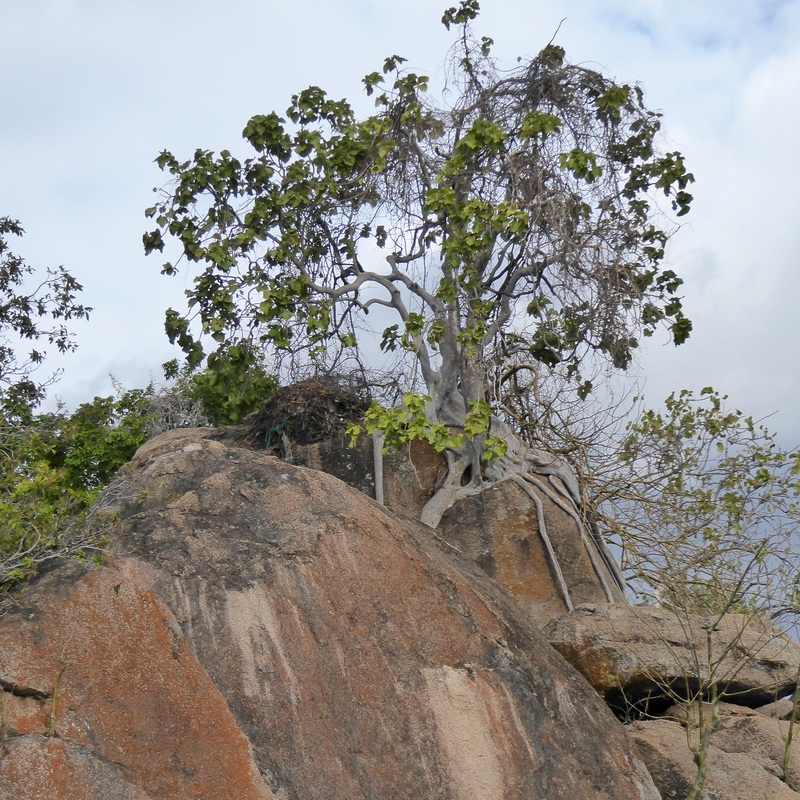 Now we are heading to Chongoni, a UNESCO World Heritage Site, to see old rock art. 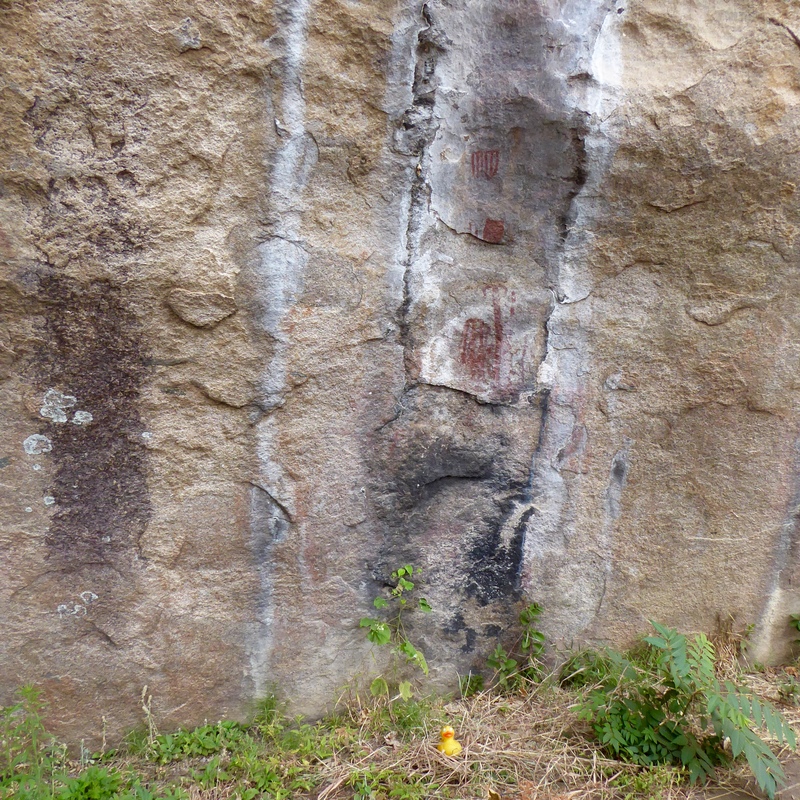 The Rock Art of Chongoni would be very difficult to find without a guide. Fortunately we have a knowledgeable guide, so here we go. 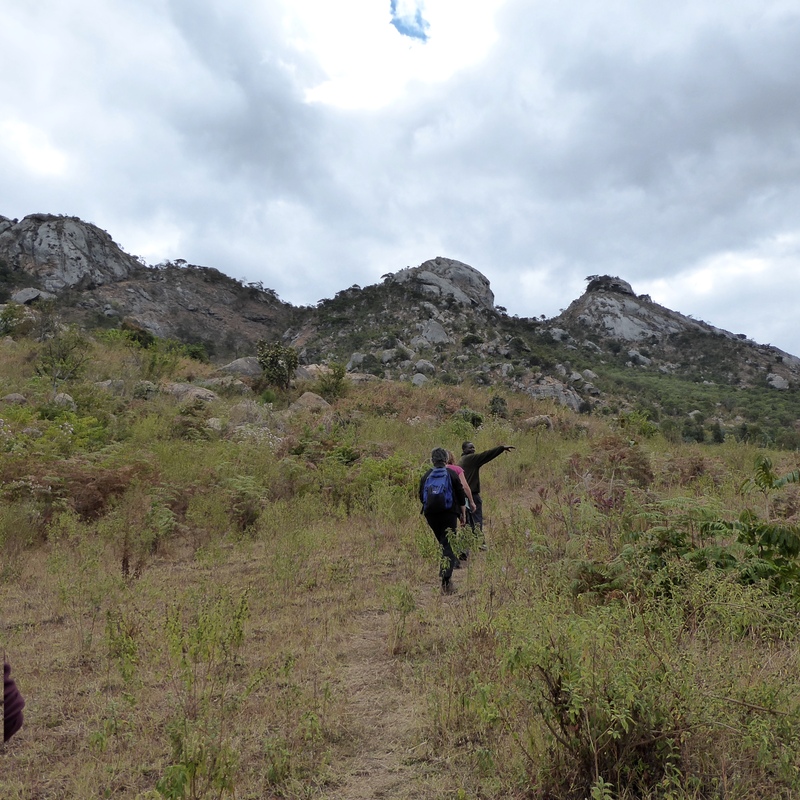 After several minutes of hiking, we are near the top and our first cave dwelling with old rock art. 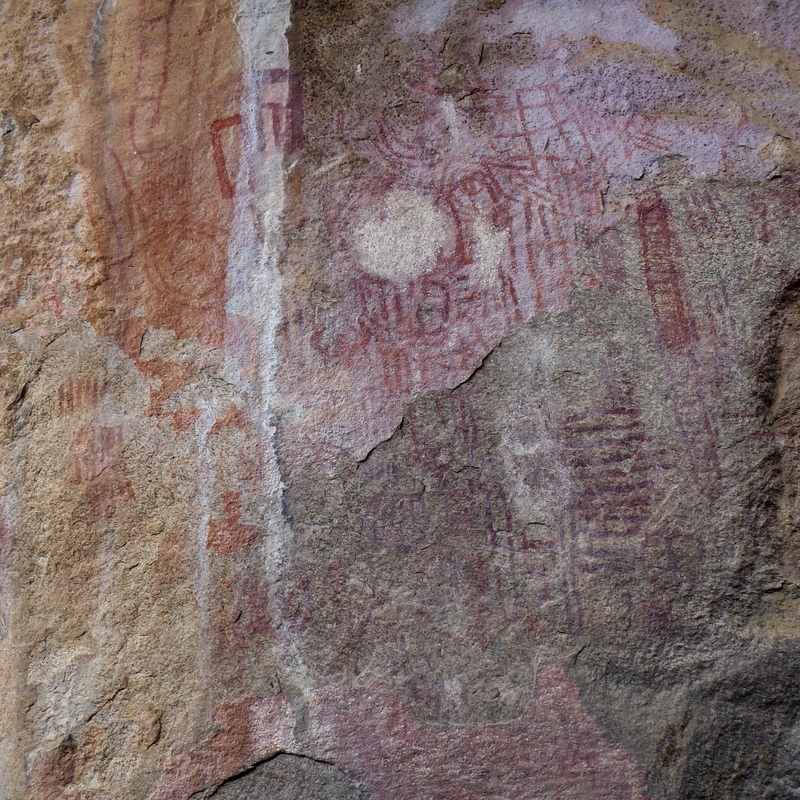 Inside this cave dwelling, our guide points out old painting on the ceiling. I liked this reptile done with darker paint. This is incredible. 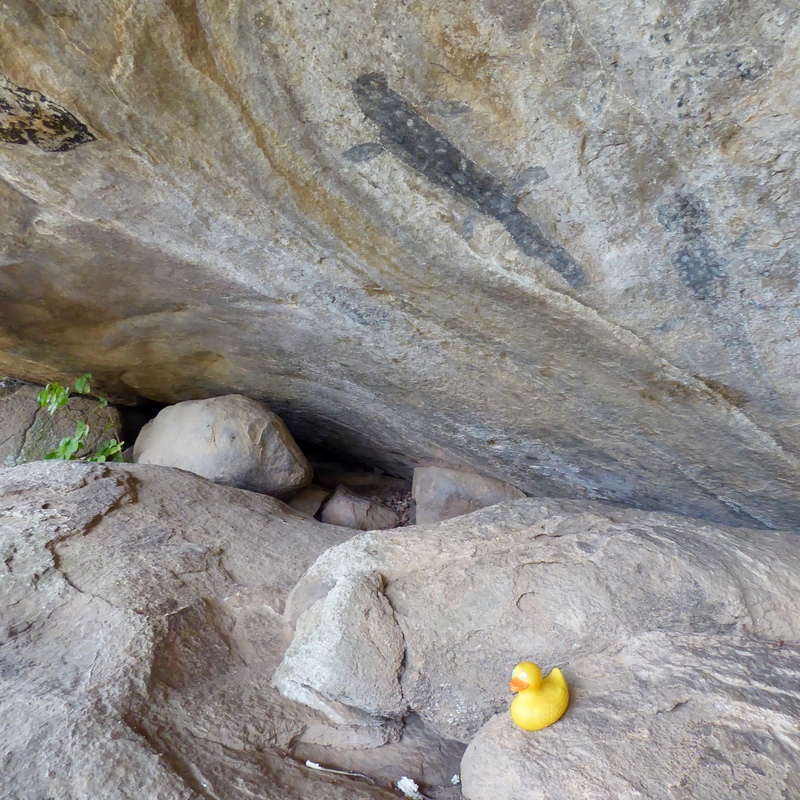 This art is in a cave dwelling and near the top of these rocks. 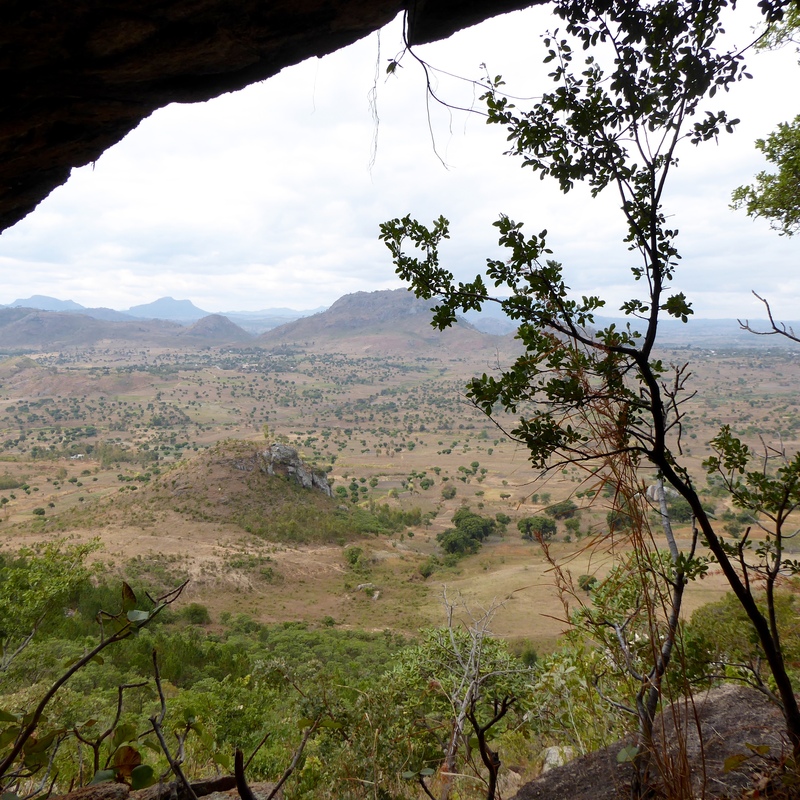 This is the view from inside the cave dwelling, looking outside. Climbing back down, our guide takes us to a different style of rock painting. Our guide is very cheerful. The space between the rocks is rather narrow. 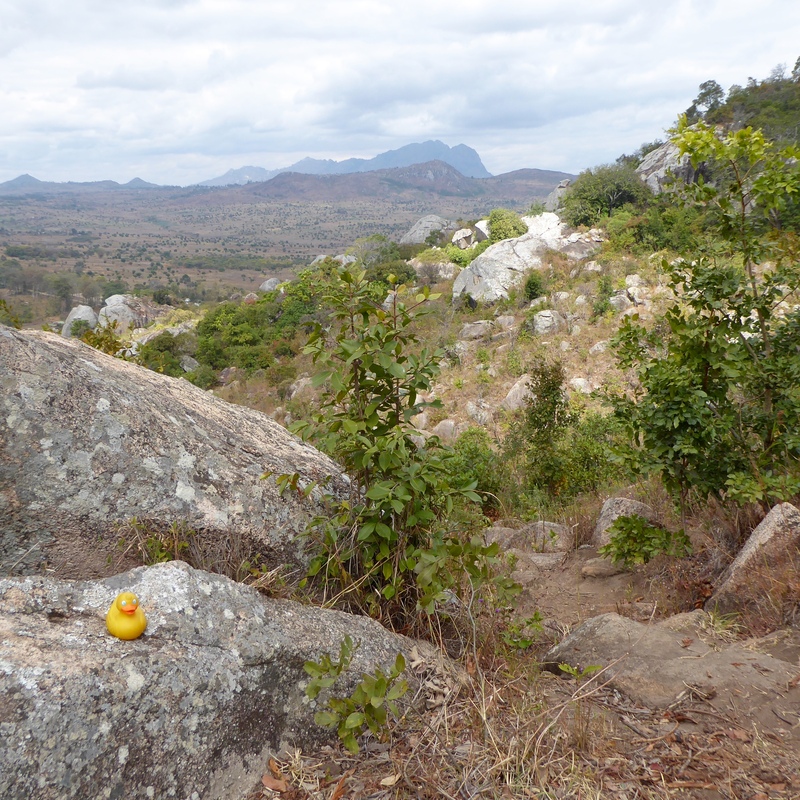 We are in a UNESCO World Heritage Site in Malawi. This is an excerpt from the committee’s document of nomination in 2006. 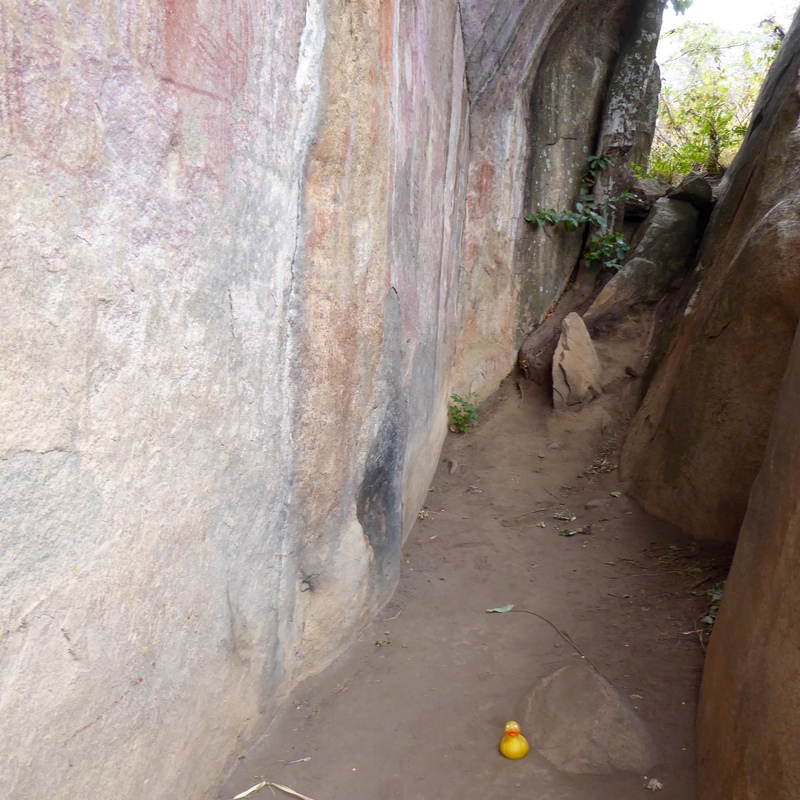 “The dense and extensive collection of rock art shelters reflects a remarkable persistence of cultural traditions over many centuries … in the Chewa agricultural society. 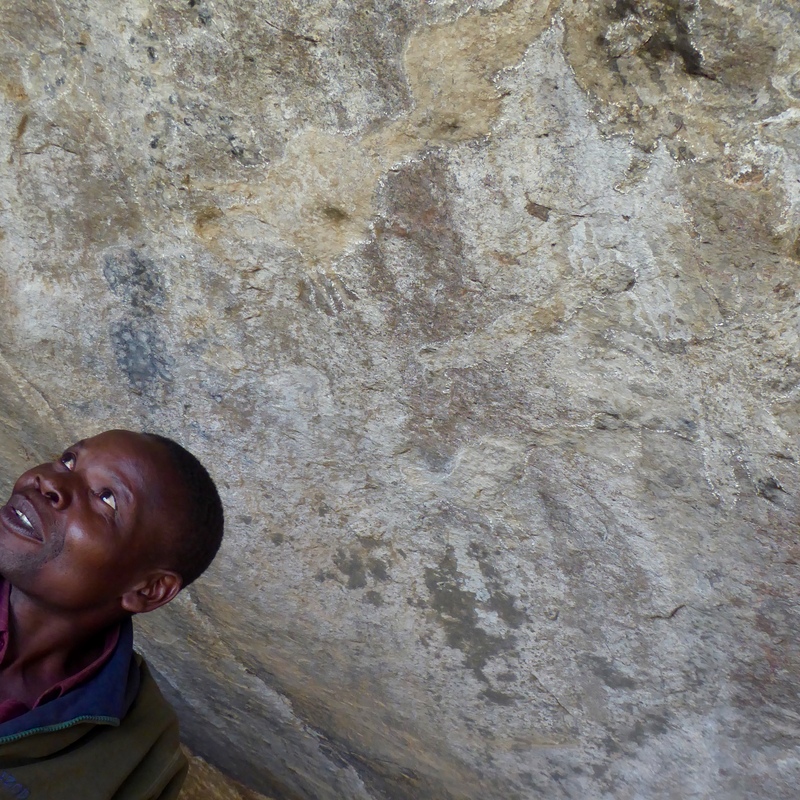 The strong association between the rock art images and contemporary traditions of initiation and of the nyau secret society, and the extensive evidence for those traditions within the painted images over many centuries, together make the Chongoni landscape a powerful force in Chewa society and a significant place for the whole of southern Africa.” Wow! Centuries! 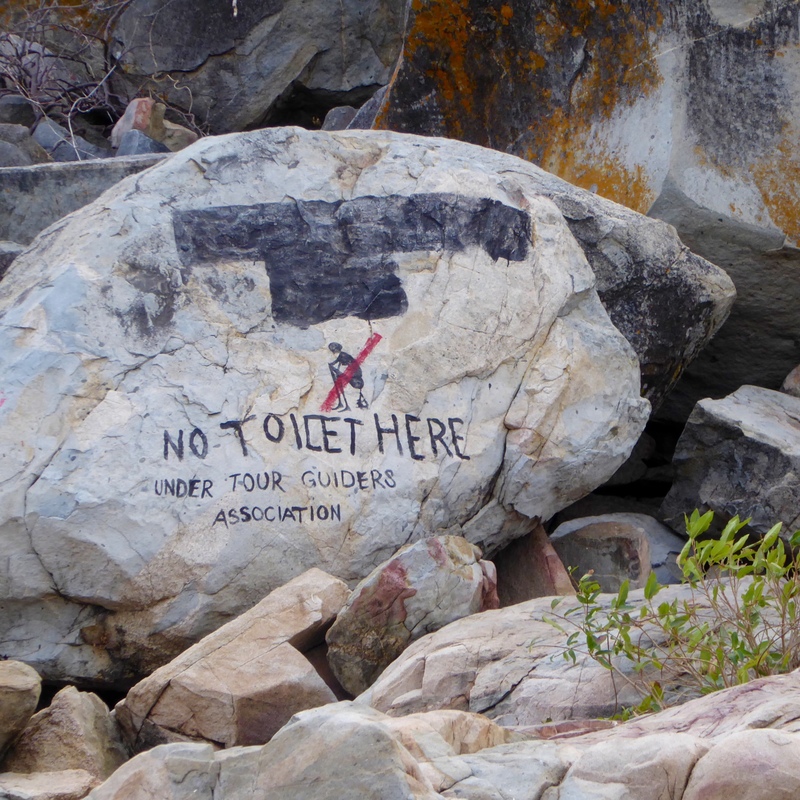 I liked visiting Chongoni Rock Art. I liked seeing the art, and our guide made this adventure so interesting. Rocks and tree really tall. Our happy guide and new friend. 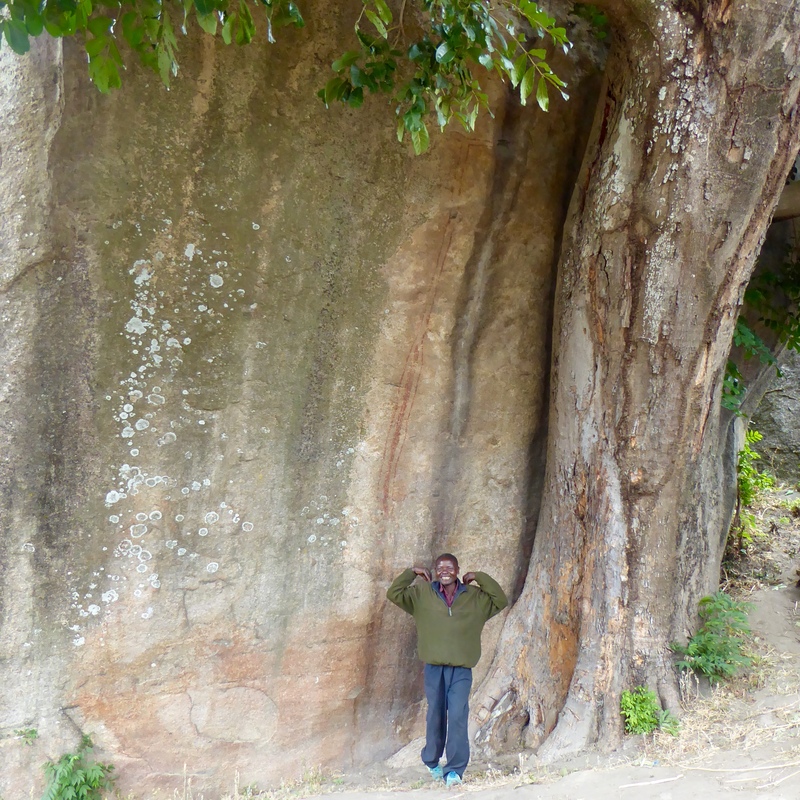 If you visit Malawi, we hope you visit Chongoni also. 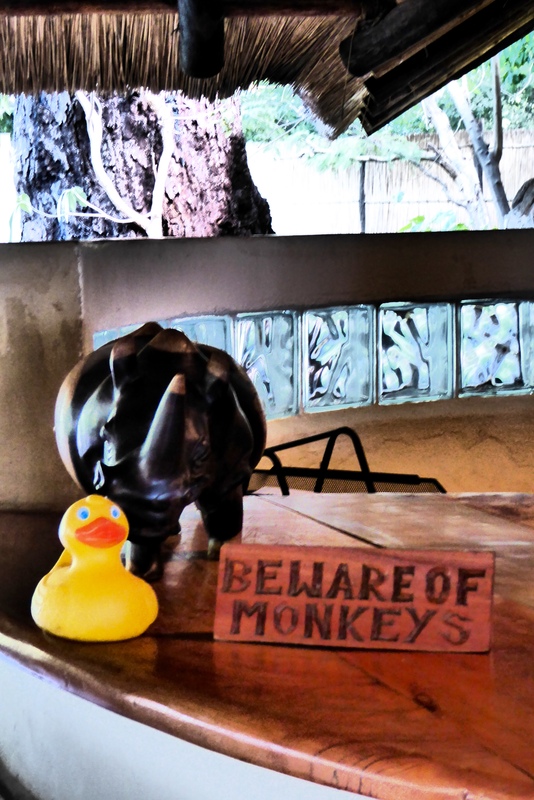 Remember, we have much more to tell you about our adventures in Africa, and also some adventures in Colorado. 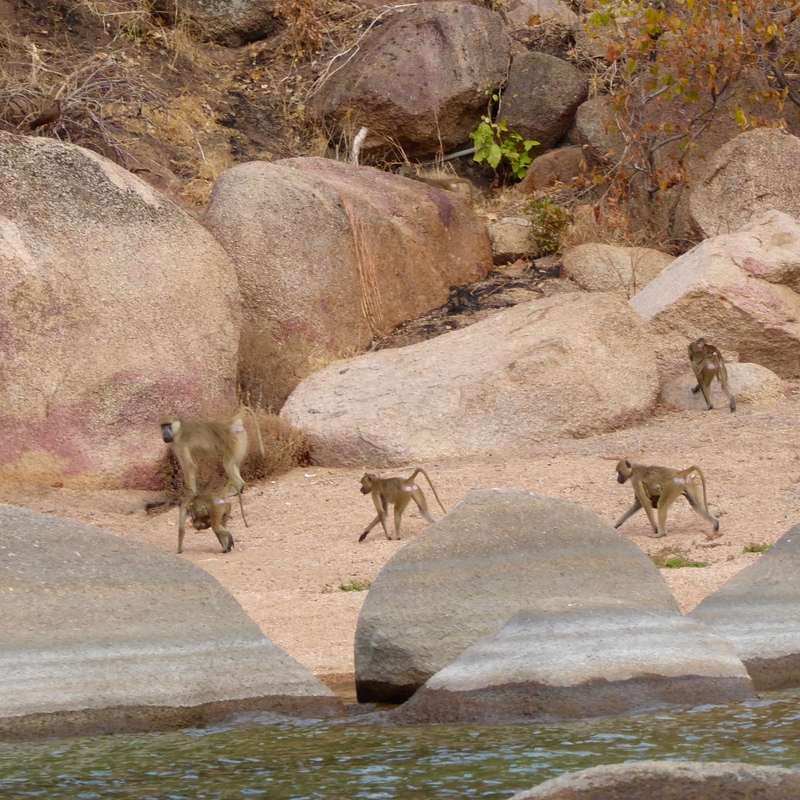 Leaving Liwonde National Park and the hippos behind, we begin our drive to Cape Maclear, on Lake Malawi. 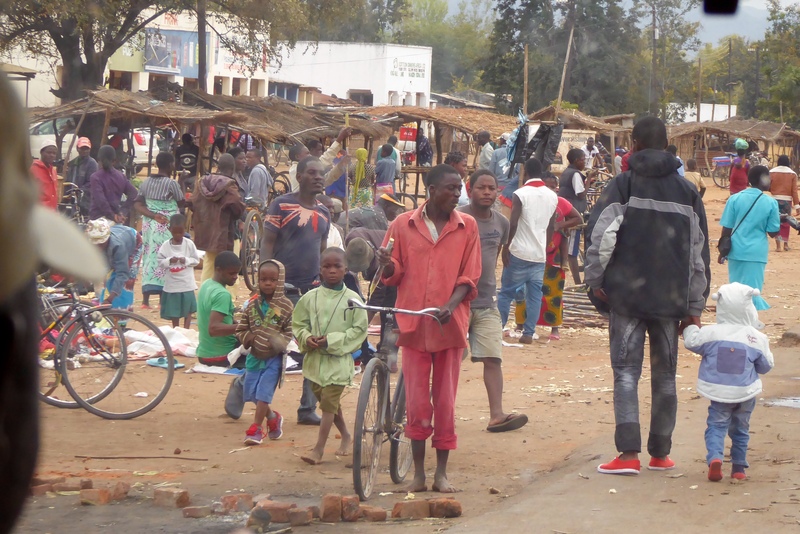 We like to see all the people going about every day life in Malawi. 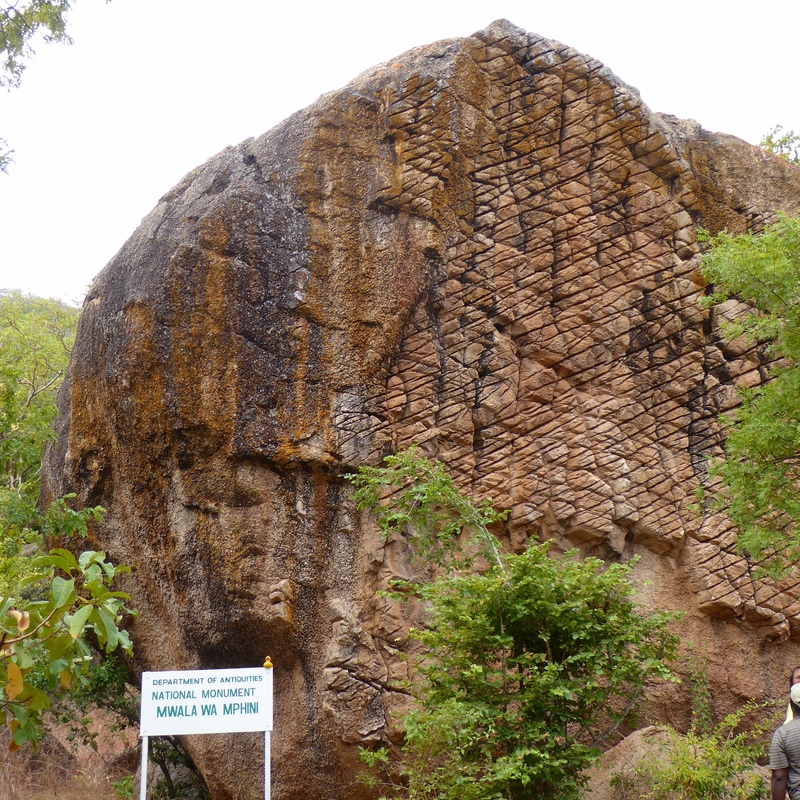 Closer to Cape Maclear we stopped at this National Monument. 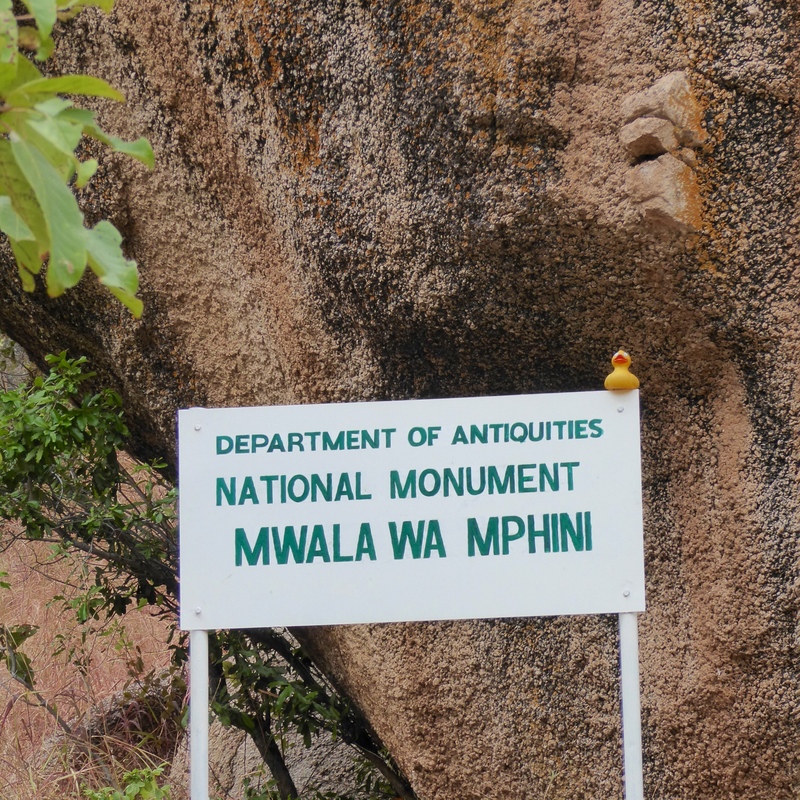 This is Mwala Wa Mphini. 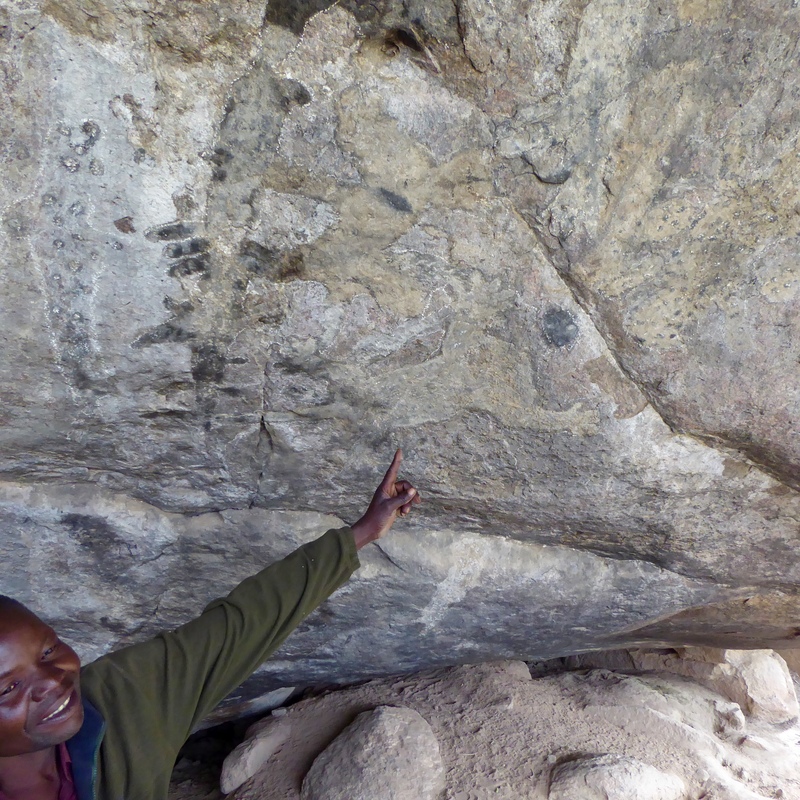 This rock, named “Rock of Tribal Face Scars” is covered with a criss-cross pattern of deep etchings that looks to be of human origin. However, according to our guide and the Brandt guidebook, the incisions are a natural geological phenomenon, created by the uneven weathering of an exposed crystalline rock. Isn’t this amazing? What a great rock. 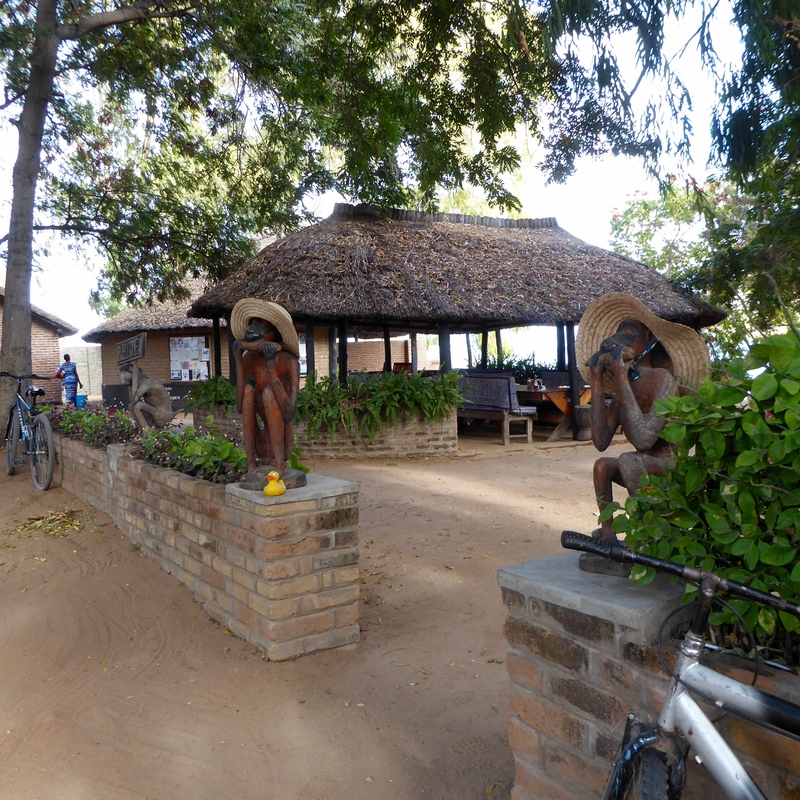 Now, 4 kilometers down the road, we have arrived at the resort of Cape Maclear. 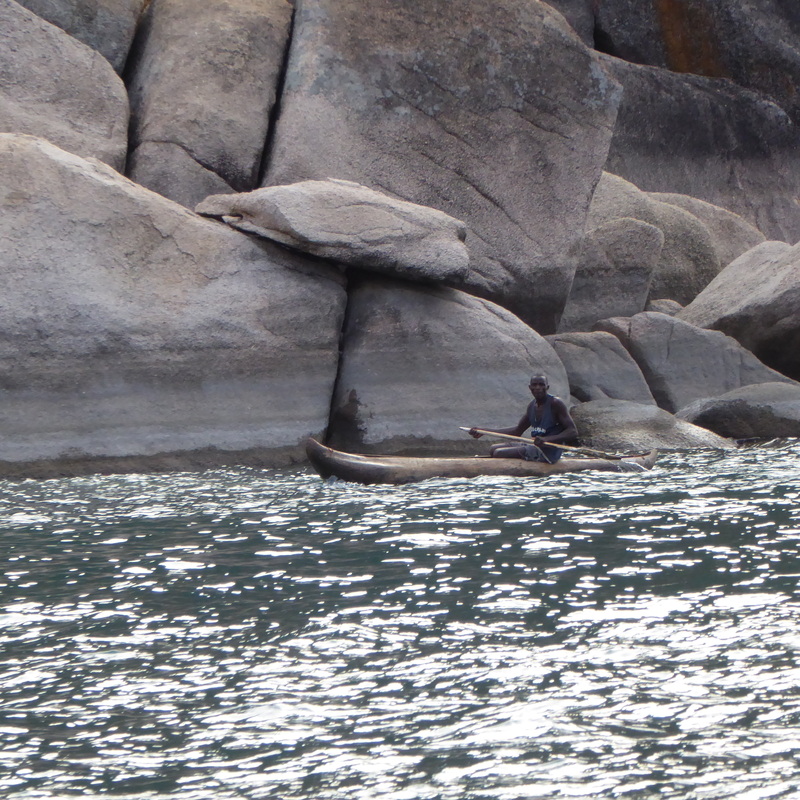 Remember those narrow dugout canoes we saw at Makuzi Beach? 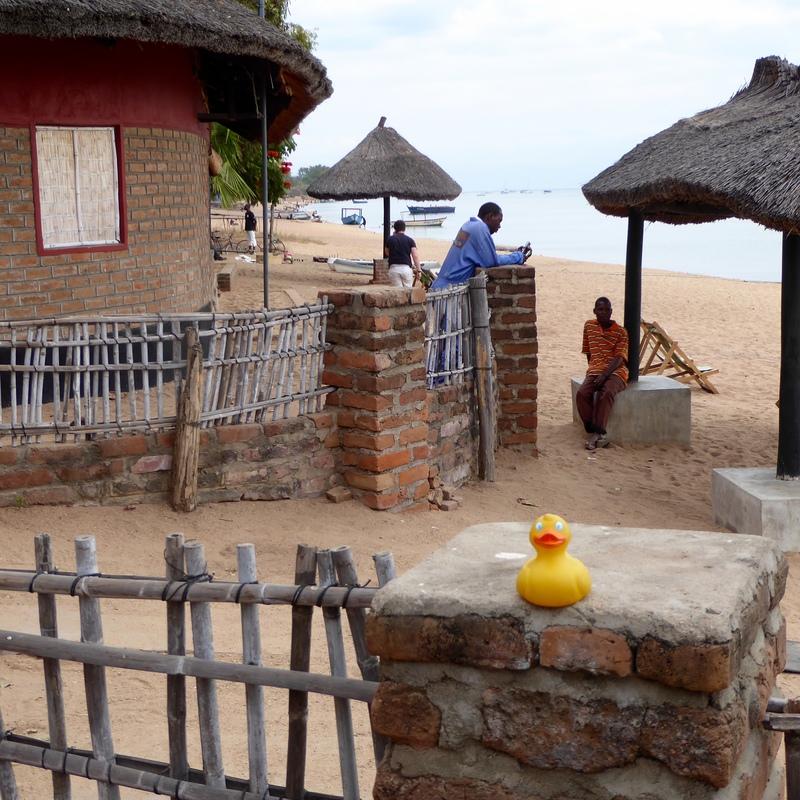 Well, here are more of the dugouts in Lake Malawi. I think these canoes are wonderful, and so picturesque. 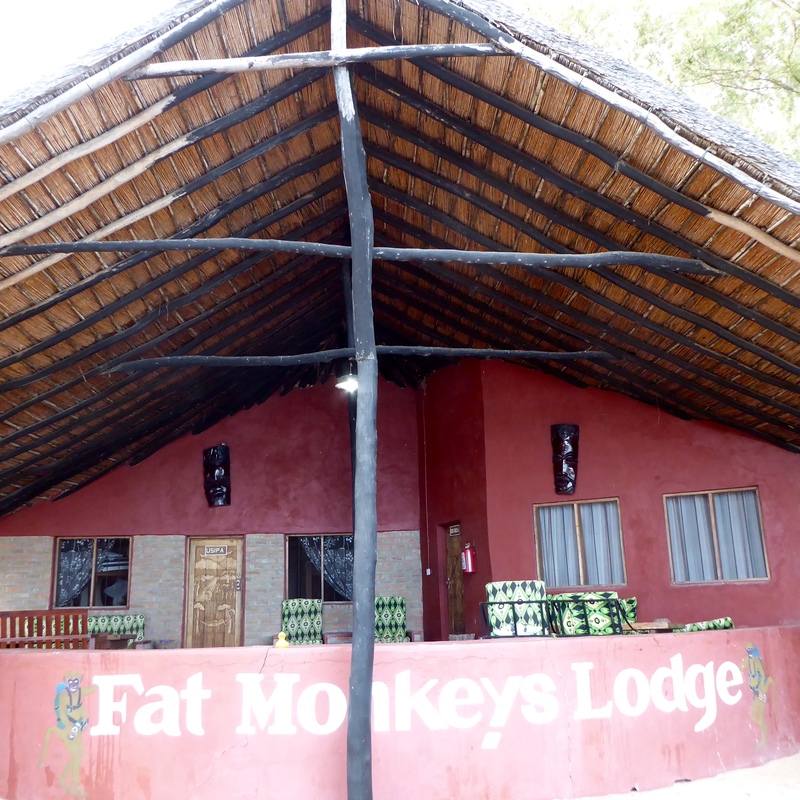 We are camping tonight, but Fat Monkeys Lodge is connected to our campgrounds. After a long trip, we wanted a light snack and a Diet Coke. 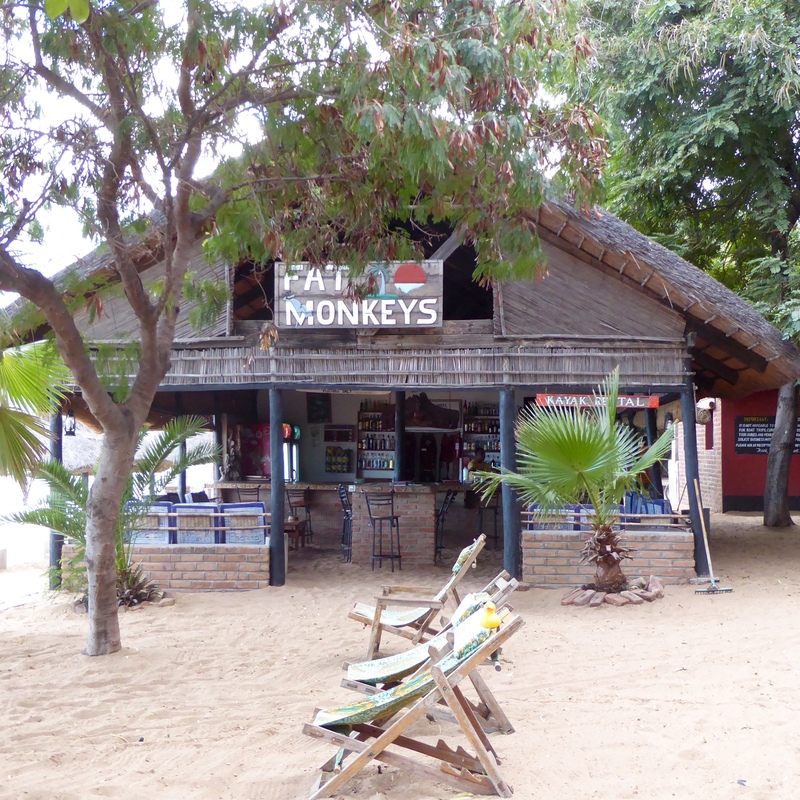 The Fat Monkeys Bar and Grill was our choice. 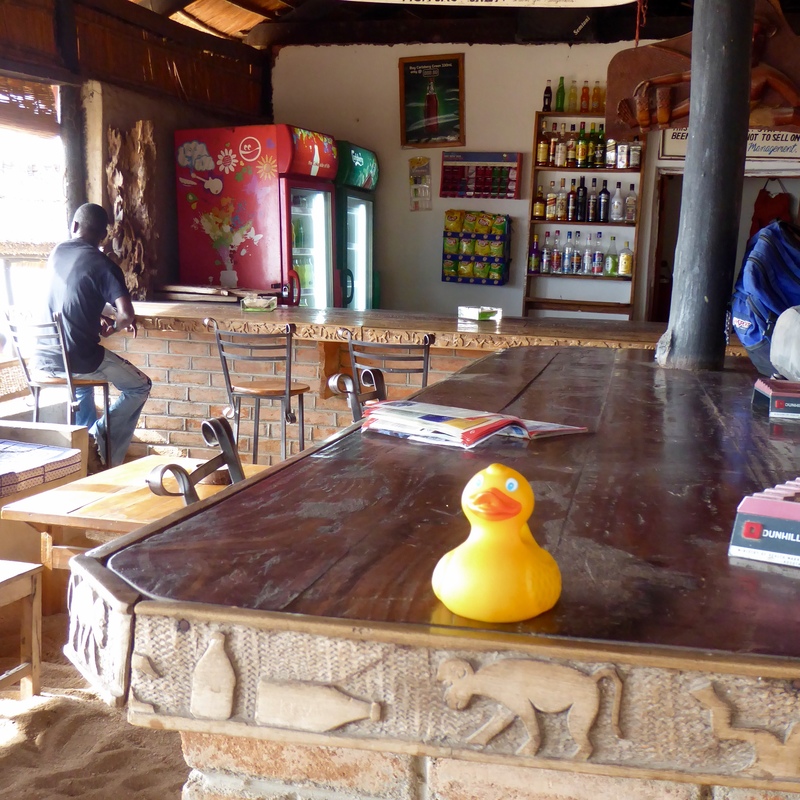 However, it was difficult for this Colorado Traveling Duck to leave the lounge chair, but the thought of a cold beverage persuaded me to enter this establishment. Look at the great carvings on the edge of this wooden bar. 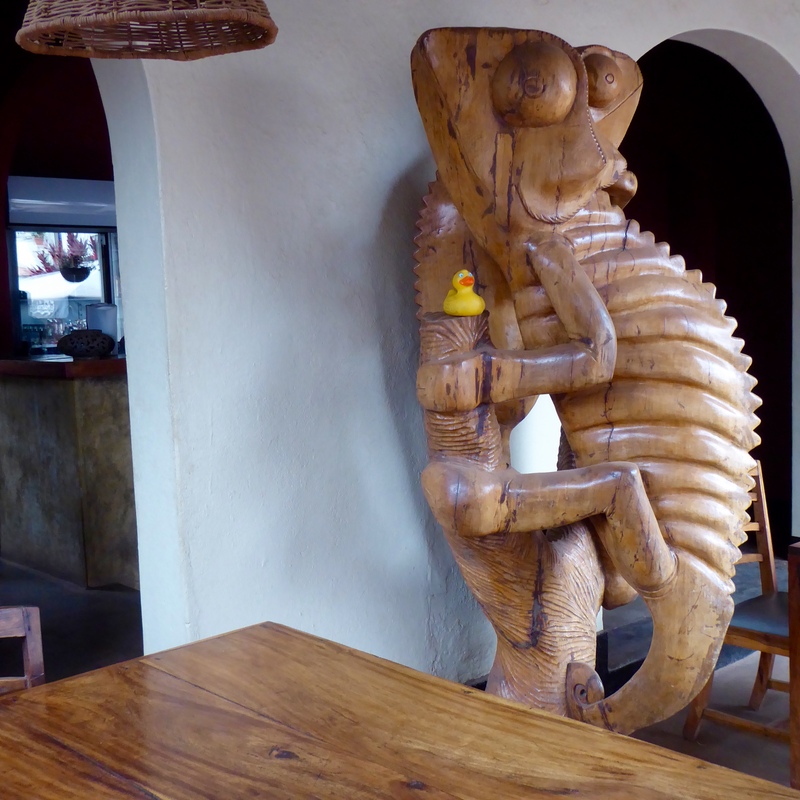 Much of the woodwork in this bar had fabulous carvings. I really admire this wood. 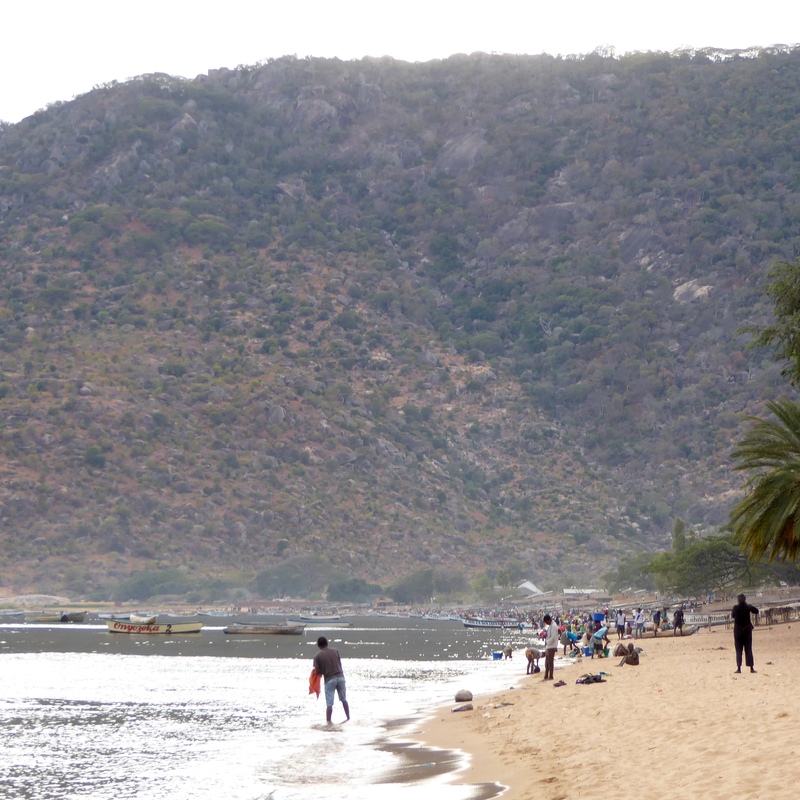 After our refreshment, we checked out our new beach. We like a resort in a town. 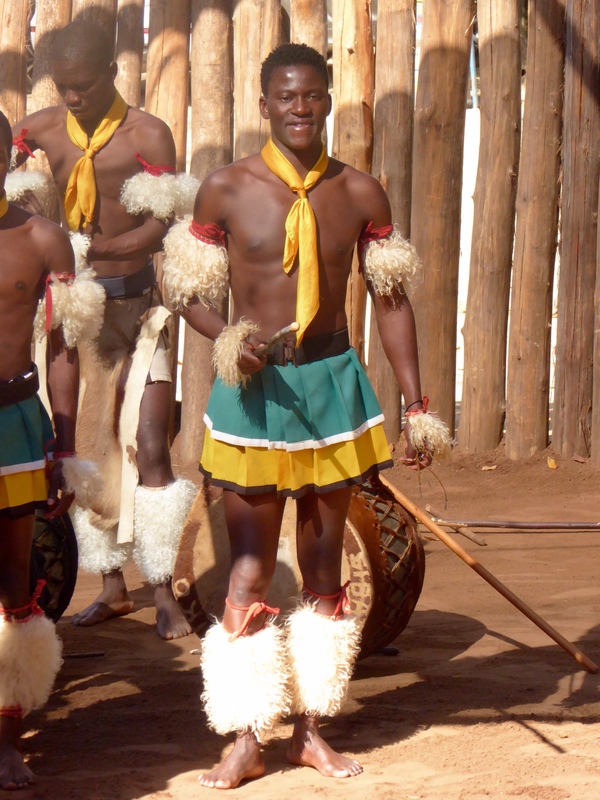 We enjoy seeing the local people as they live here. 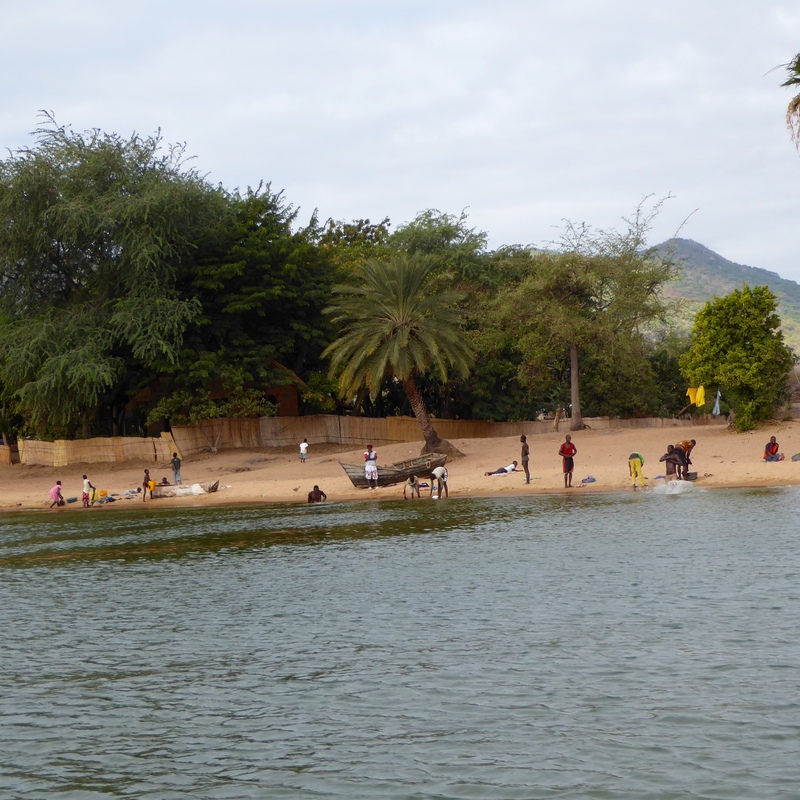 This shows the people, the lake and the nearby mountain. Mom and I love beaches and mountains together. 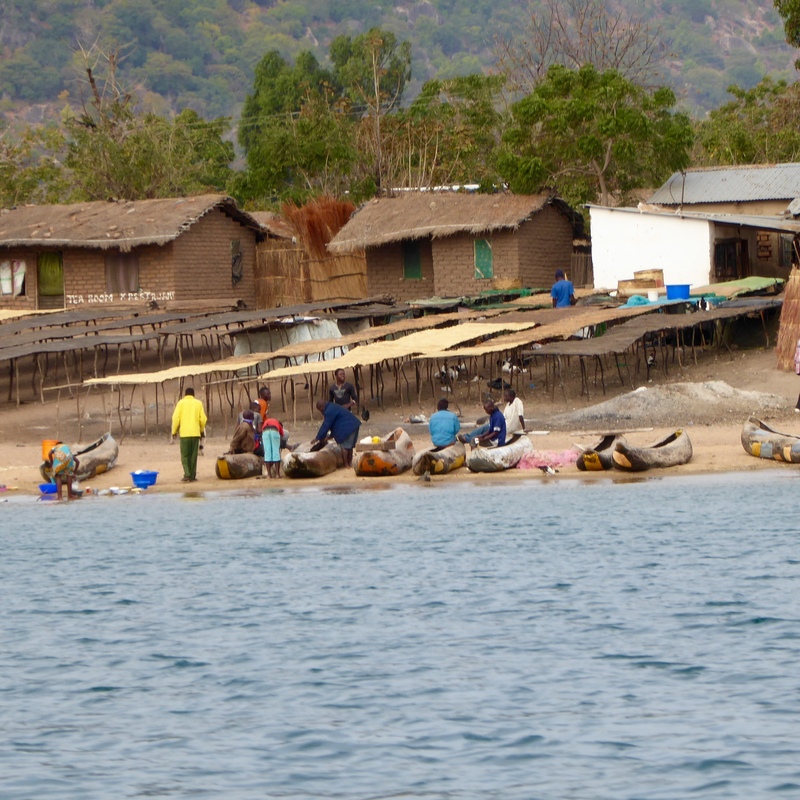 Here is more of Cape Maclear on Lake Malawi. Perhaps another short rest would be good. Of course, shopping is always interesting. 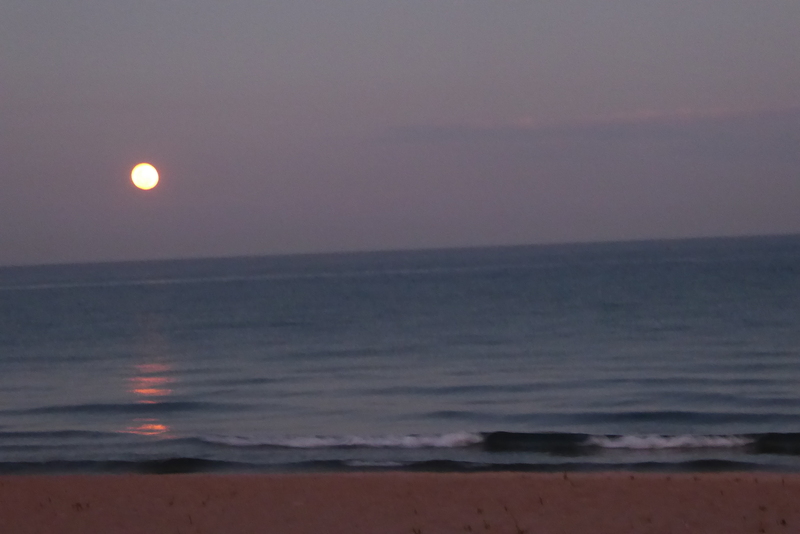 Maybe it is time to leave the beach for a short time. 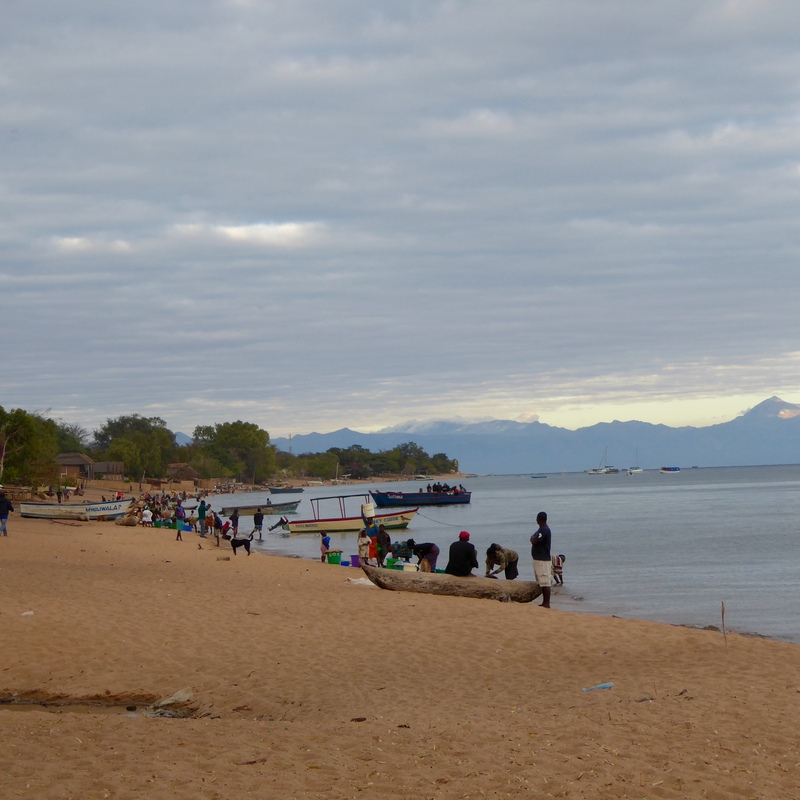 As you can see, Cape Maclear is a very busy location for many people and a very relaxing location for tourists. The people here were very friendly. 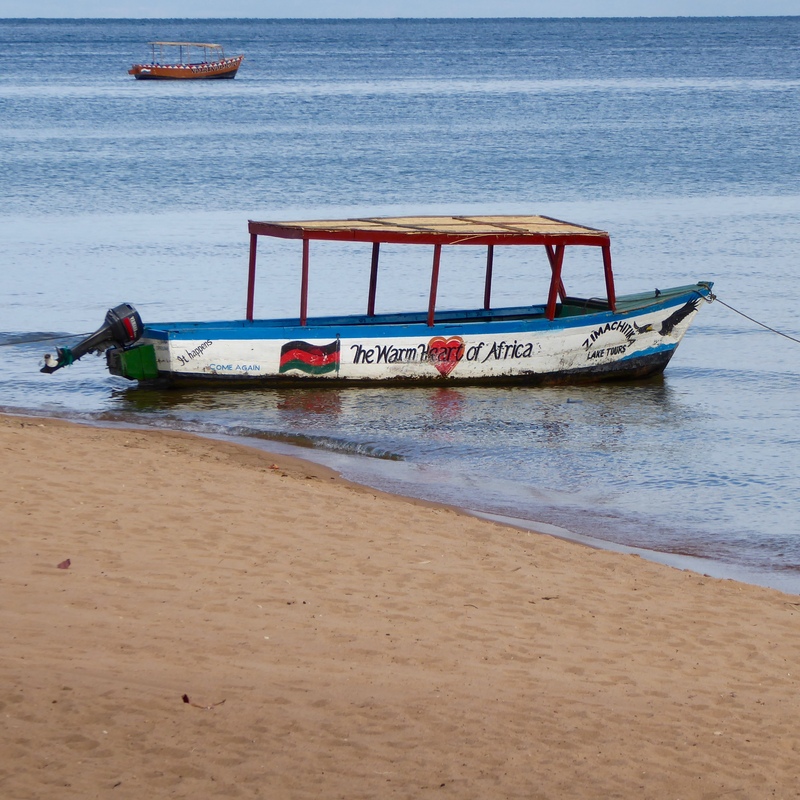 This is one reason Malawi is often referred to as the Warm Heart of Africa. Mom and I, Zeb the Duck, believe this boat. 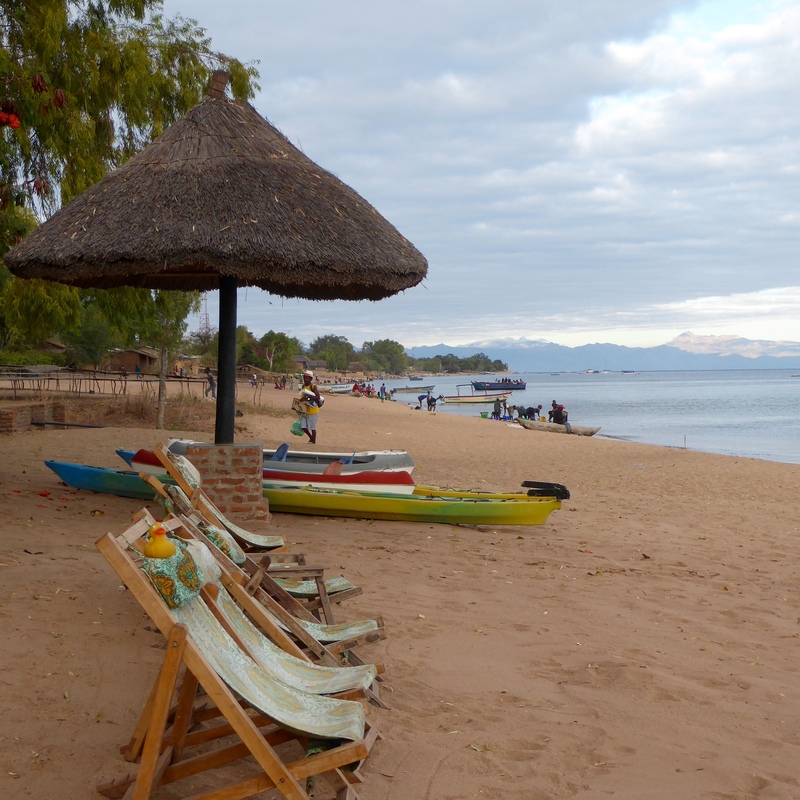 Malawi and the people certainly have shown us a very warm and welcoming heart. 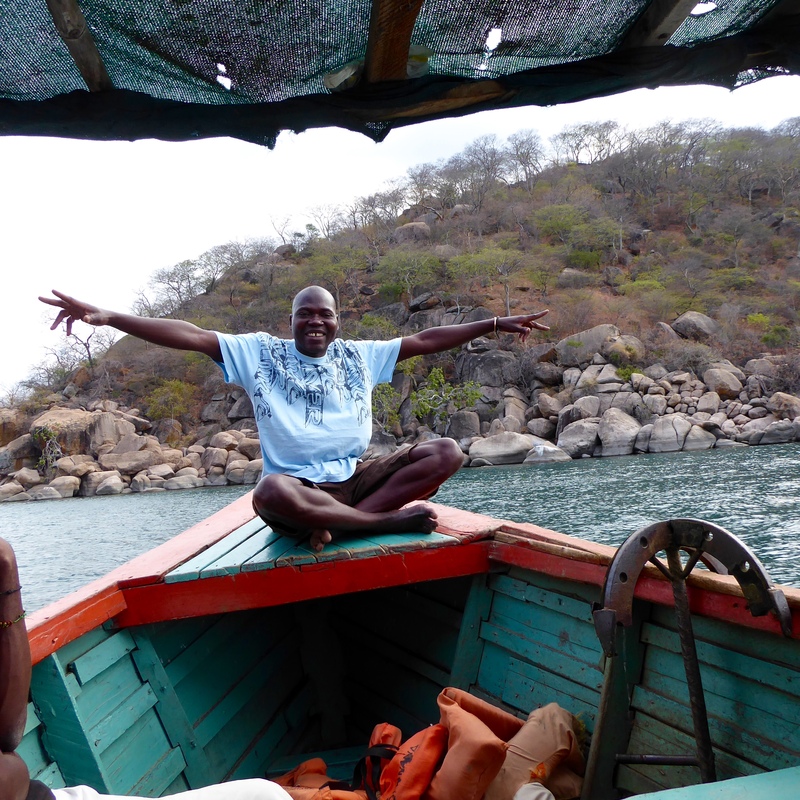 Next time we will show you more of what we did at Cape Maclear, on Lake Malawi. 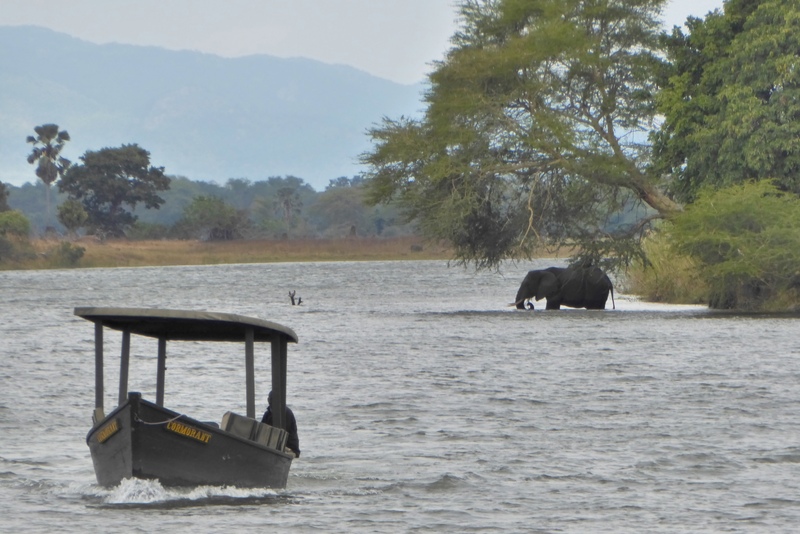 Yesterday we arrived at Liwonde National Park and enjoyed a boat safari on the Shire River. 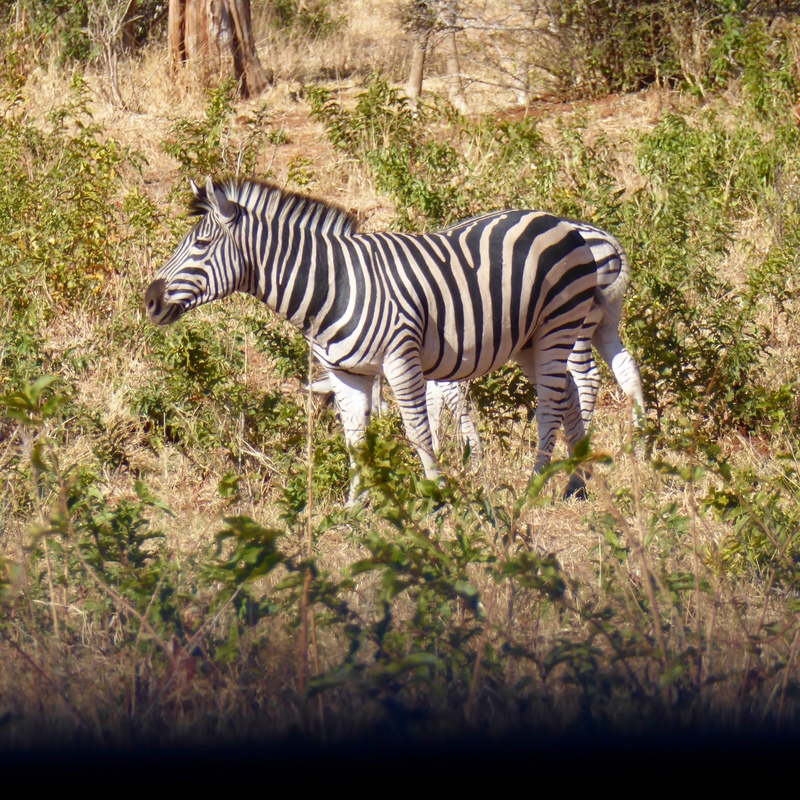 This morning we get in a safari vehicle and begin looking for more animals. 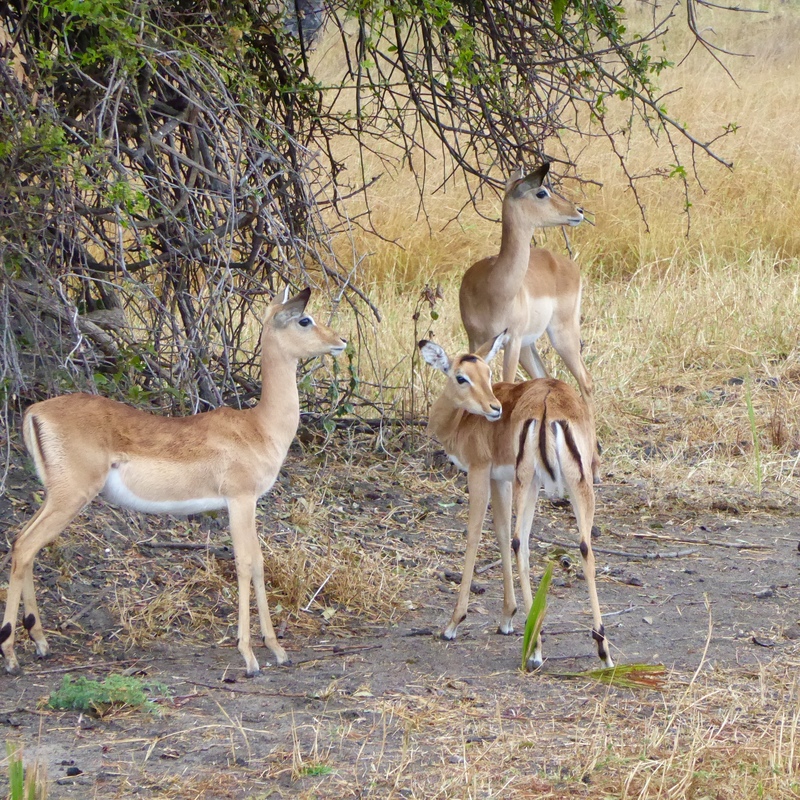 Impalas are similar to the antelope we see in the western United States. They are so delicate and graceful. 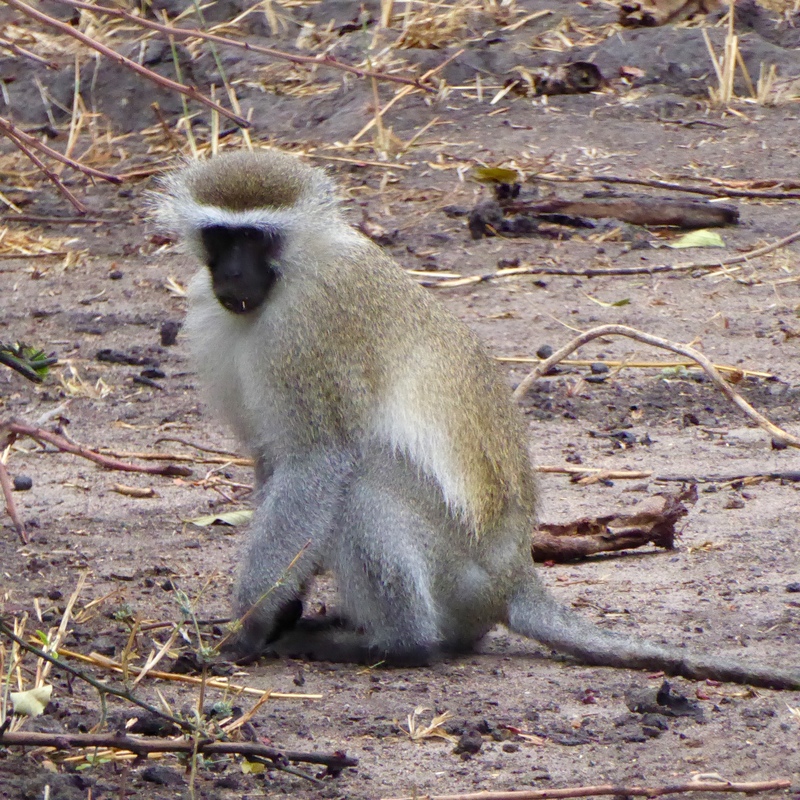 Several monkeys are seen in the trees and running through the forest. 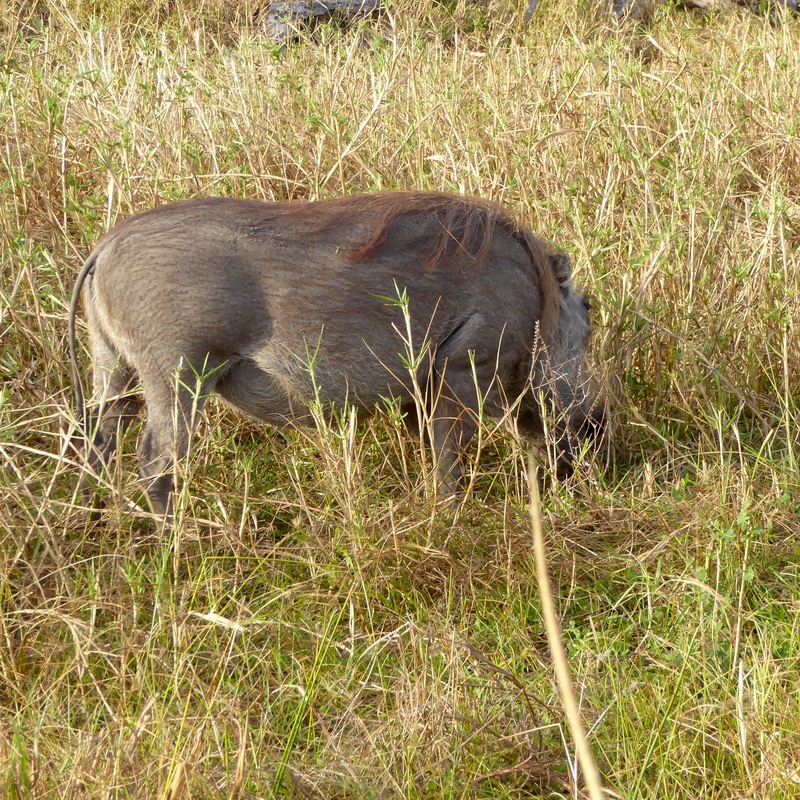 The warthogs are so much fun to watch. 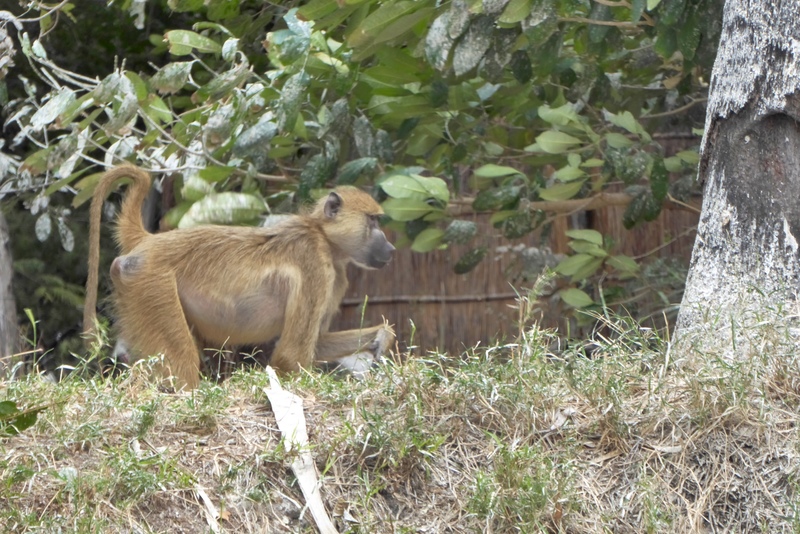 They are always scratching the ground, searching for food. When they run, they make us laugh, or at least smile. 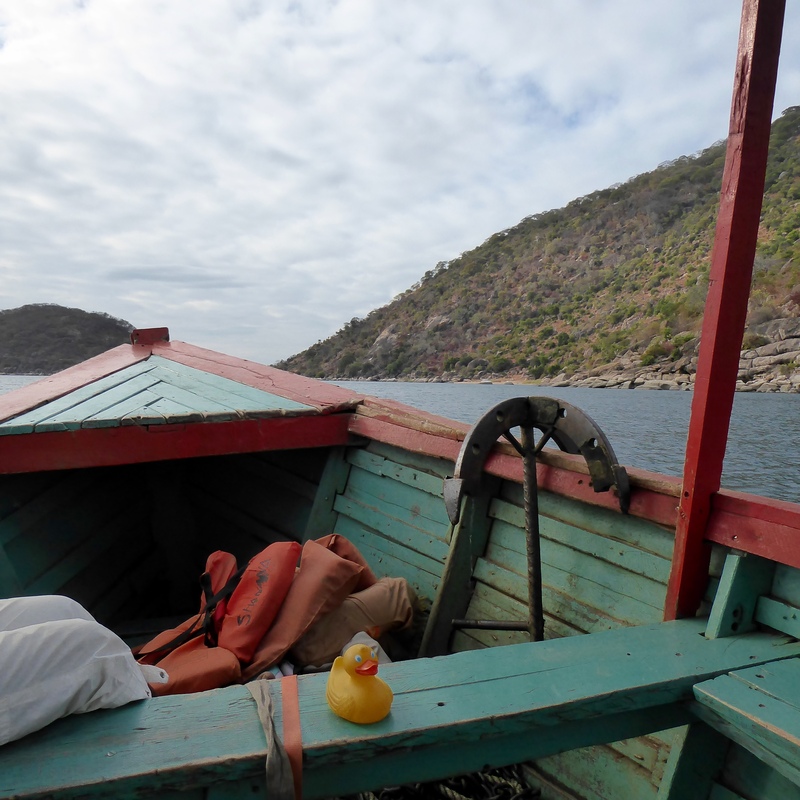 I, Zeb the Duck, am on this safari, but the ride is fairly rough, so I stay in my travel bag most of the time. But, here I am now. 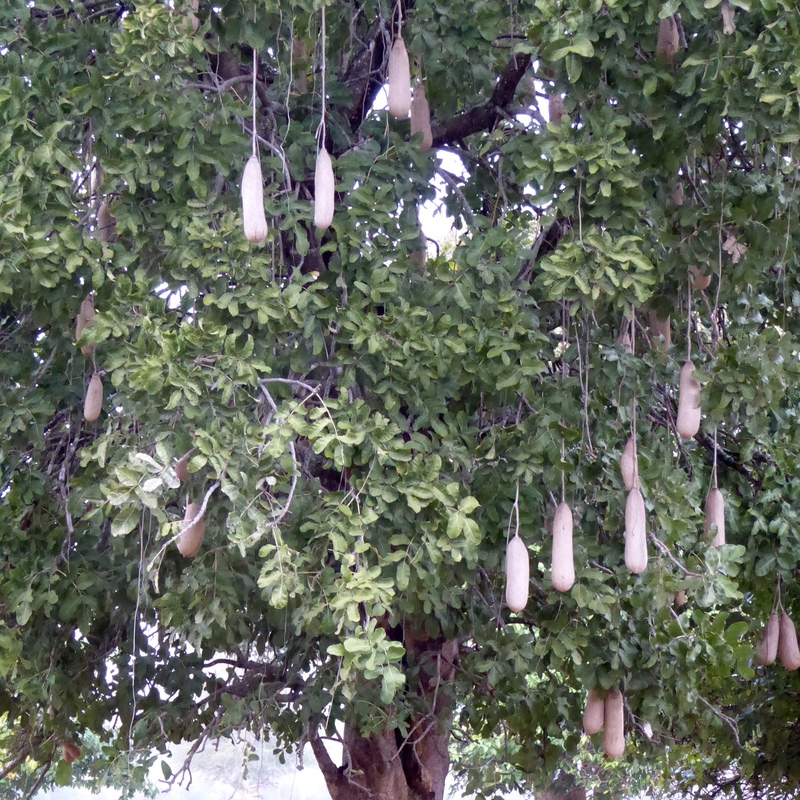 This sausage trees has these long, hanging pods that are very hard and look like sausages. 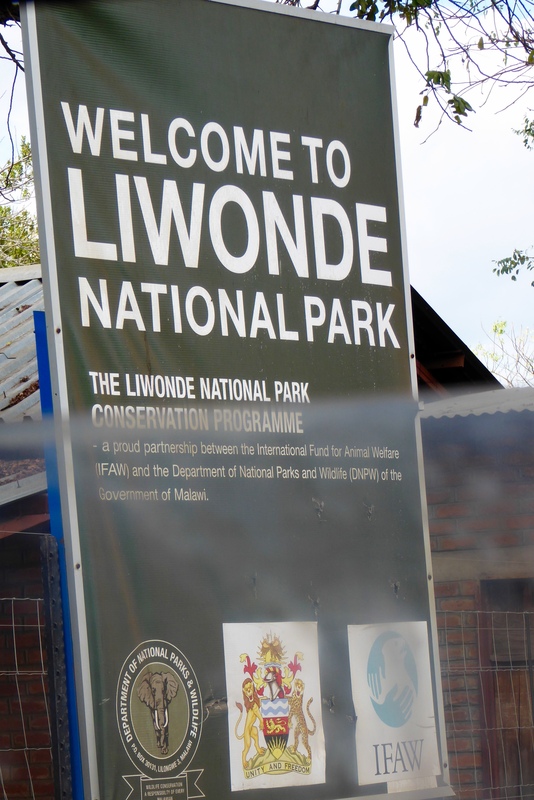 Many creatures live in Liwonde National Park. 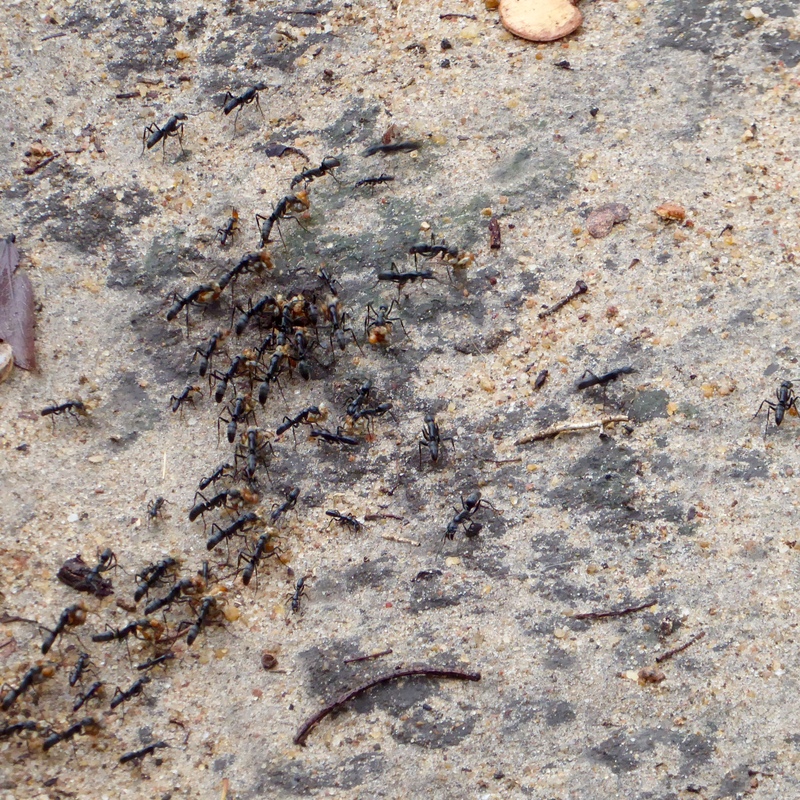 These ants are very large and very busy. 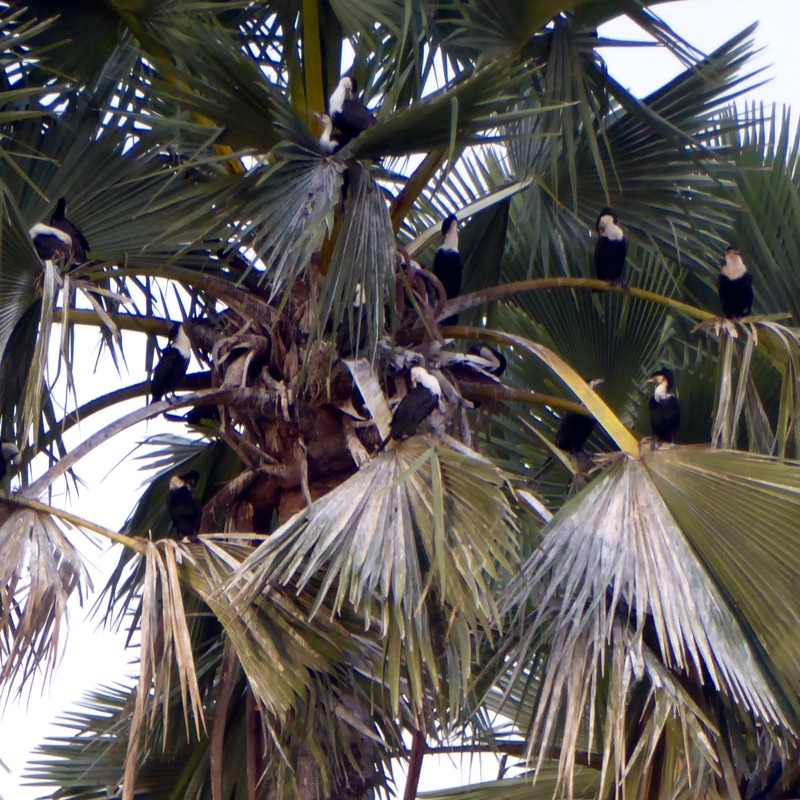 Here are more nests of the weaver birds. 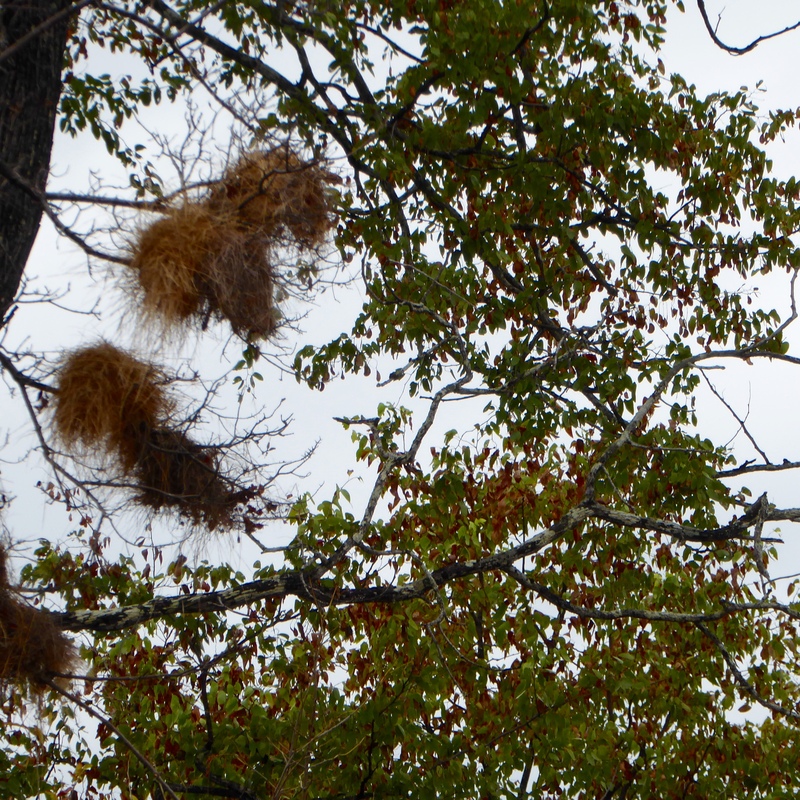 We saw some similar weaver bird nests on our first outing in Lilongwe, Malawi. 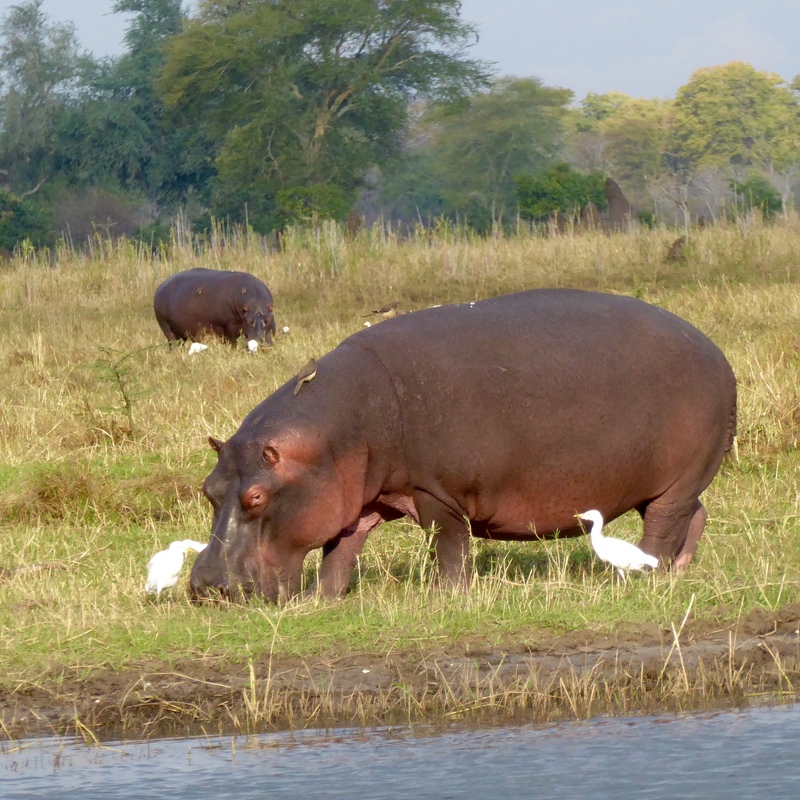 The hippos spend much of the day in the Shire River. 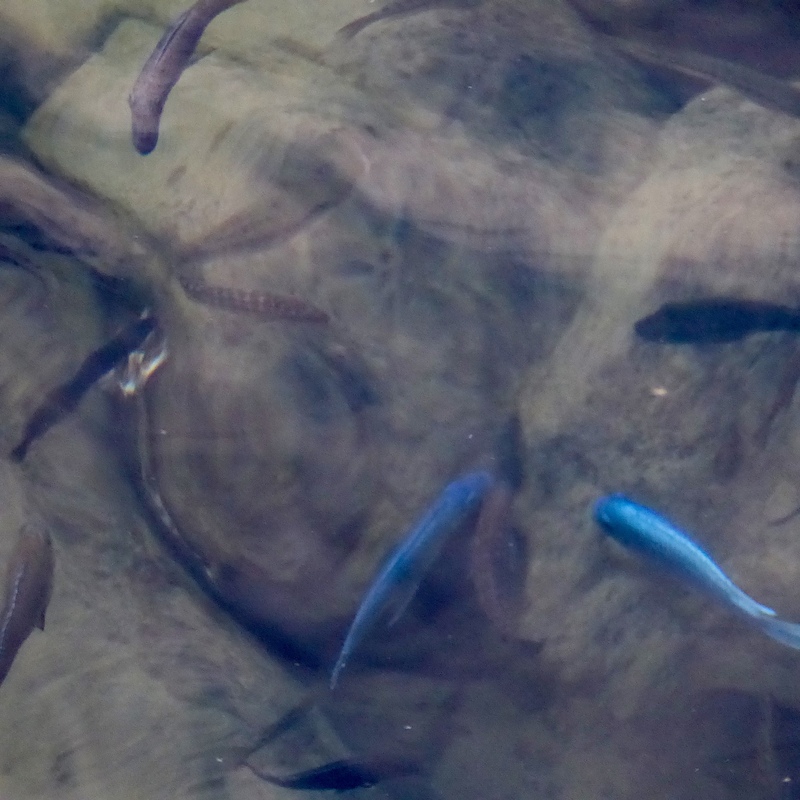 They are such large animals, but in the water you notice the large eyes watching. 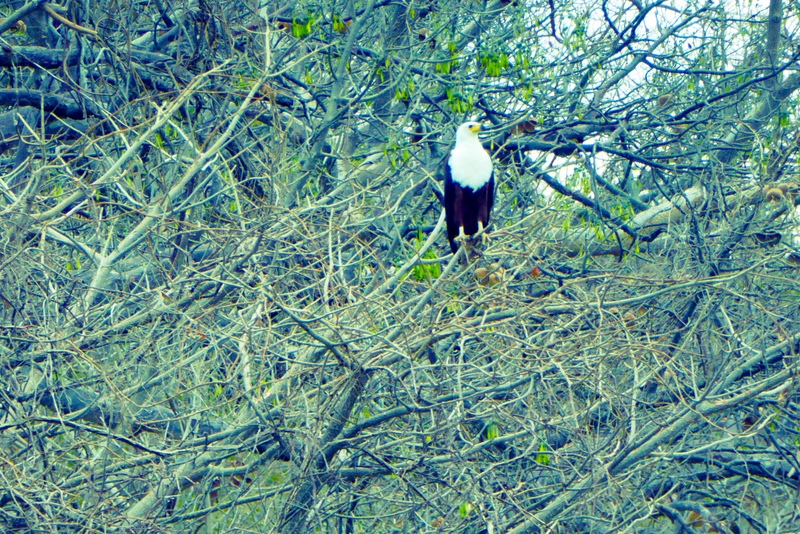 Remember this is a premier bird watching destination. 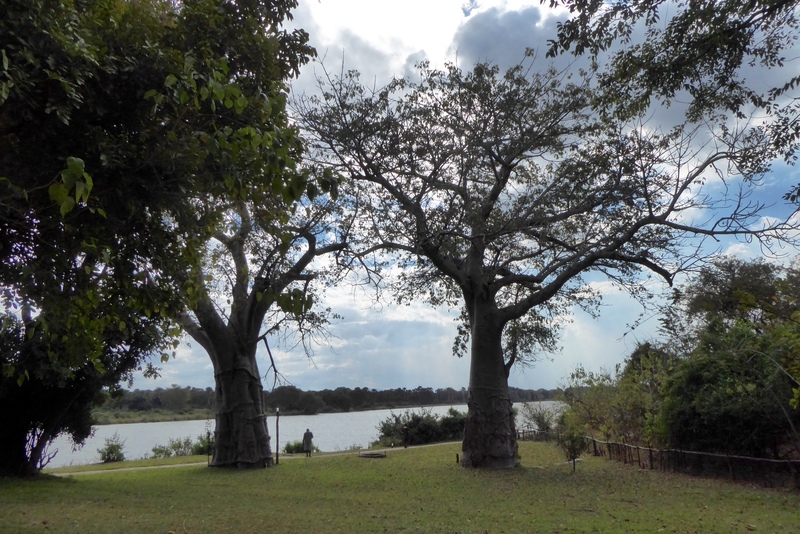 Over 400 species have been seen in this park. I love the white birds sitting in the tree. 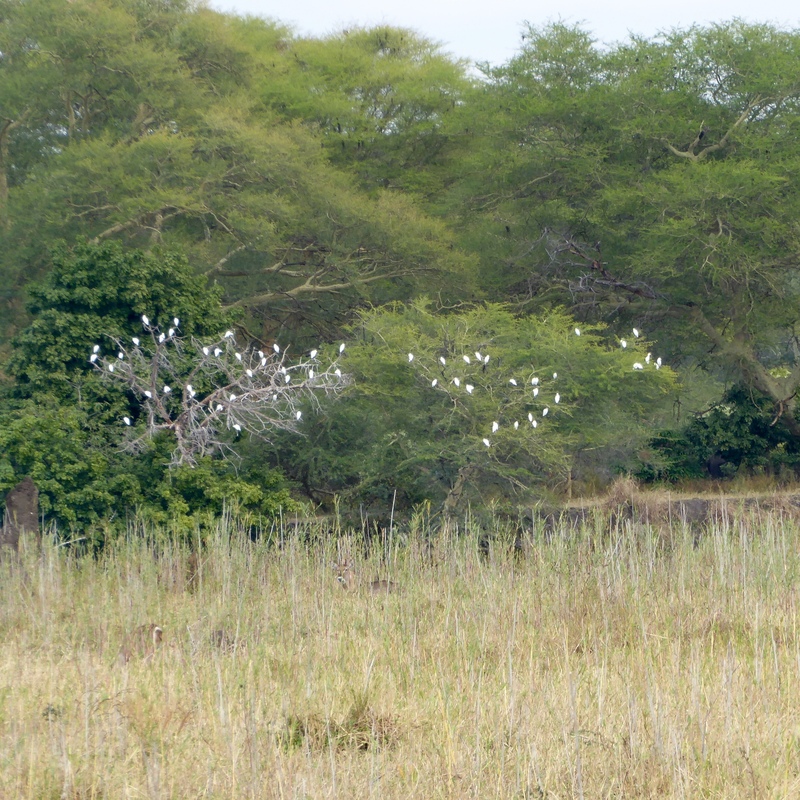 Perhaps not rare birds, but a great scene with the white birds, green tree and beautiful blue sky. 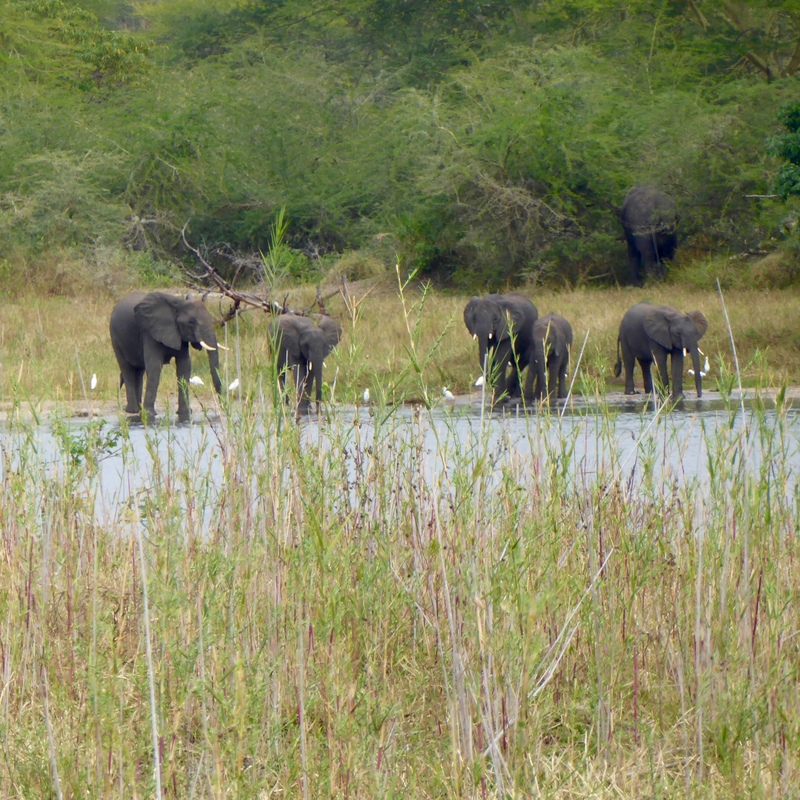 There are elephants near the river this morning. 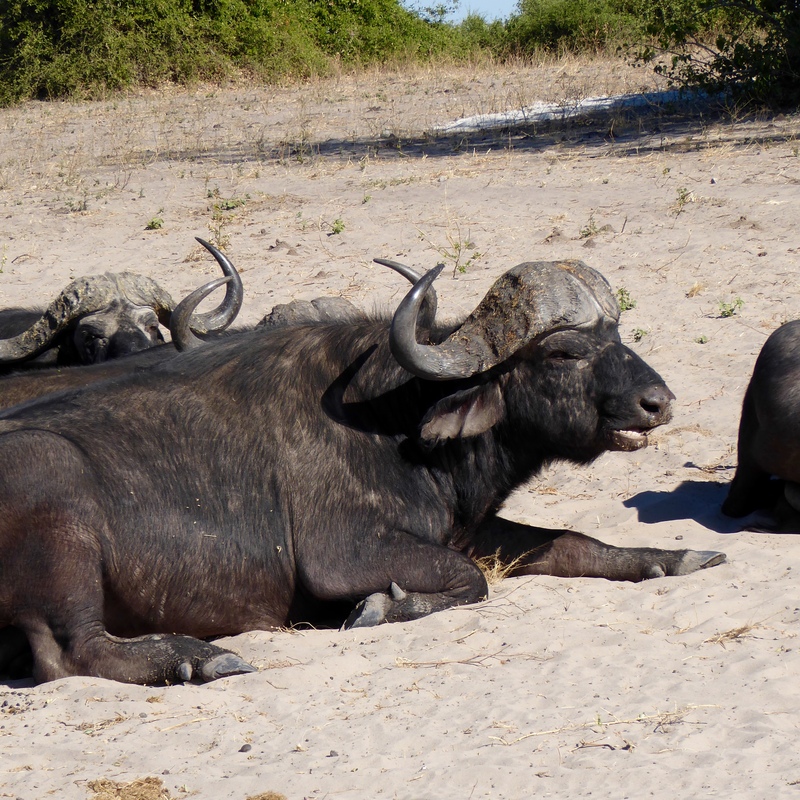 Again, large animals that are so comfortable here. 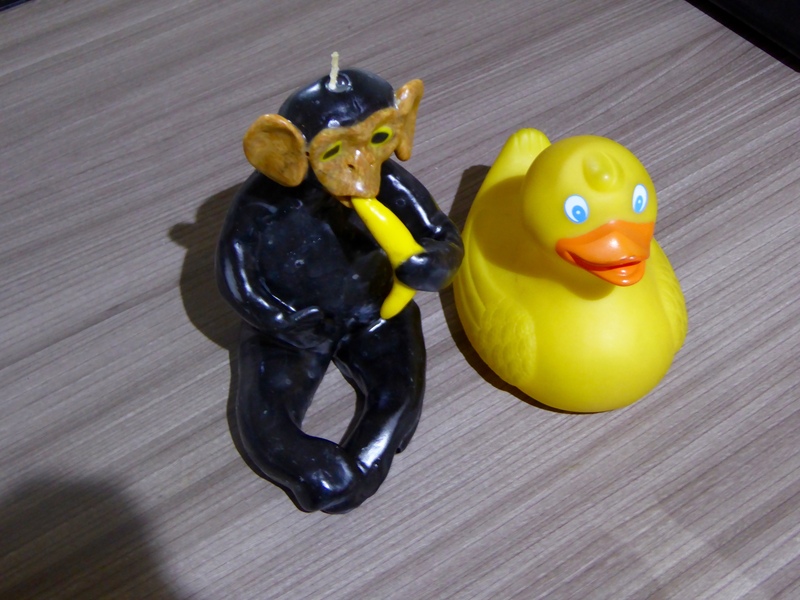 I, Zeb the Duck, like the elephants. 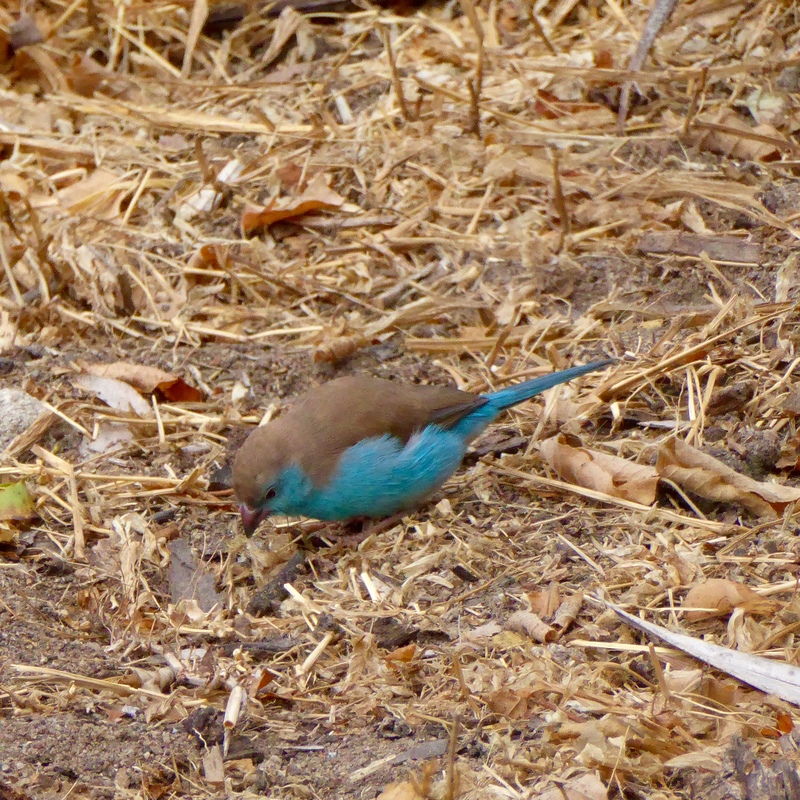 This bird has a beautiful blue tummy. Of course, as a duck, I like birds. It is time to head back across the Shire River to meet our driver, guides and chef. 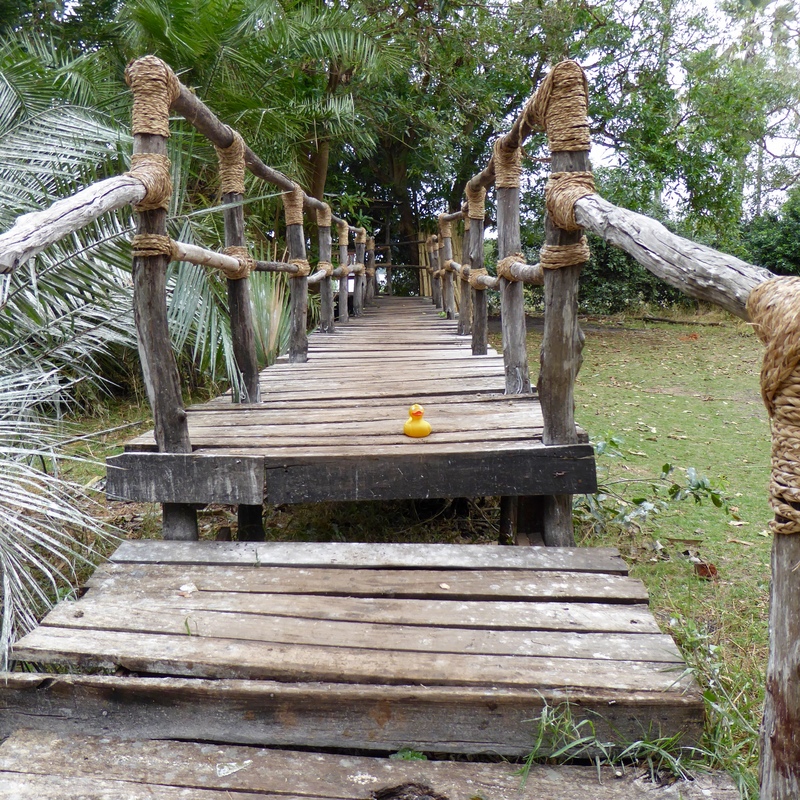 We will cross the bridge and leave Liwonde National Park, but we will have another adventure soon. Wow! 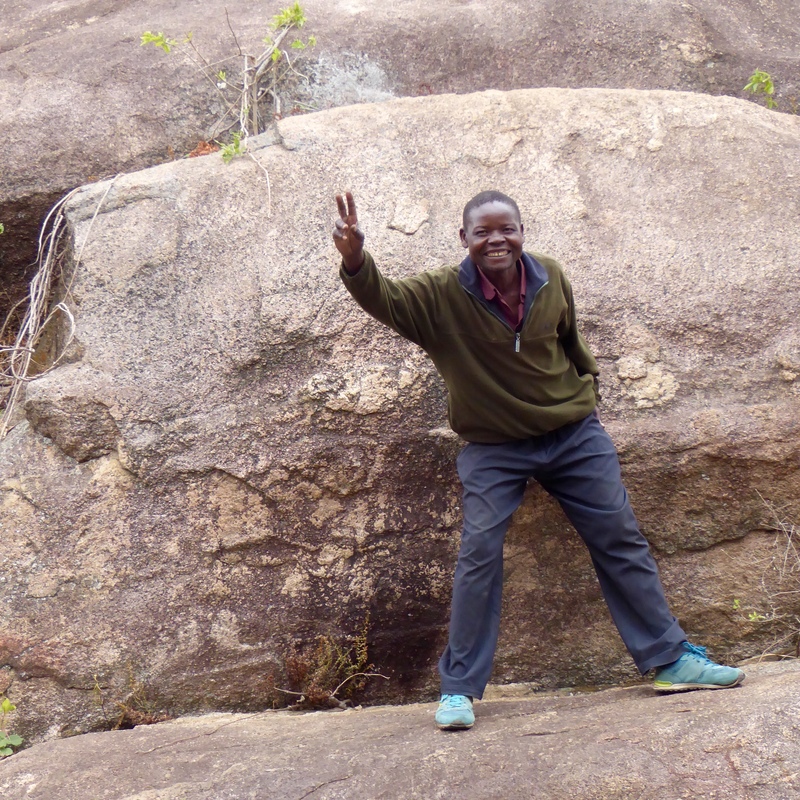 I am going to camp at Mvuu Wilderness Camp in Liwonde National Park. 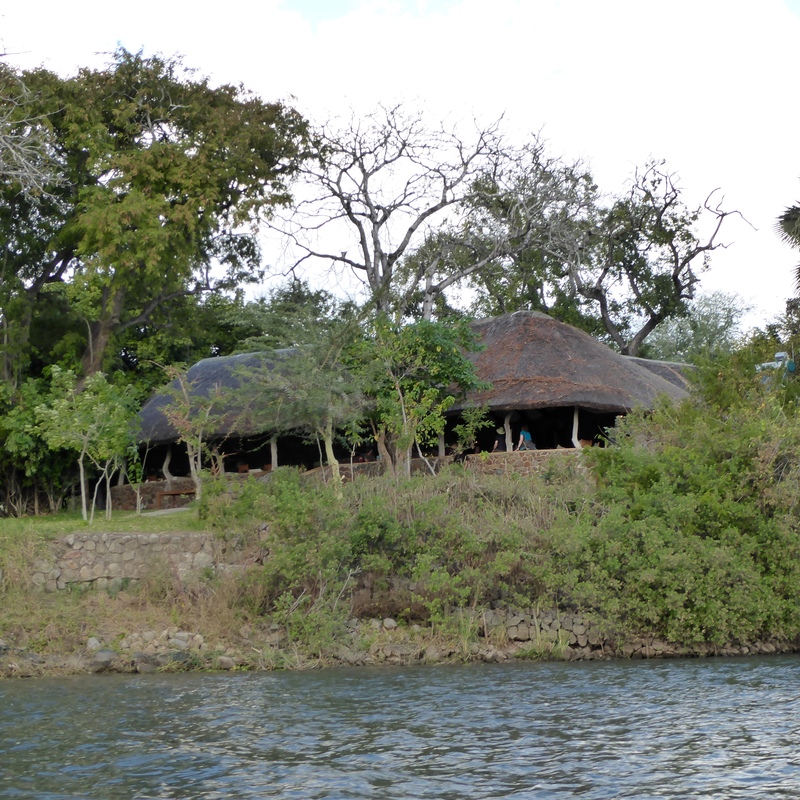 We drive to the Shire River and wait for a boat to take us across the river to the lodge and camping area. 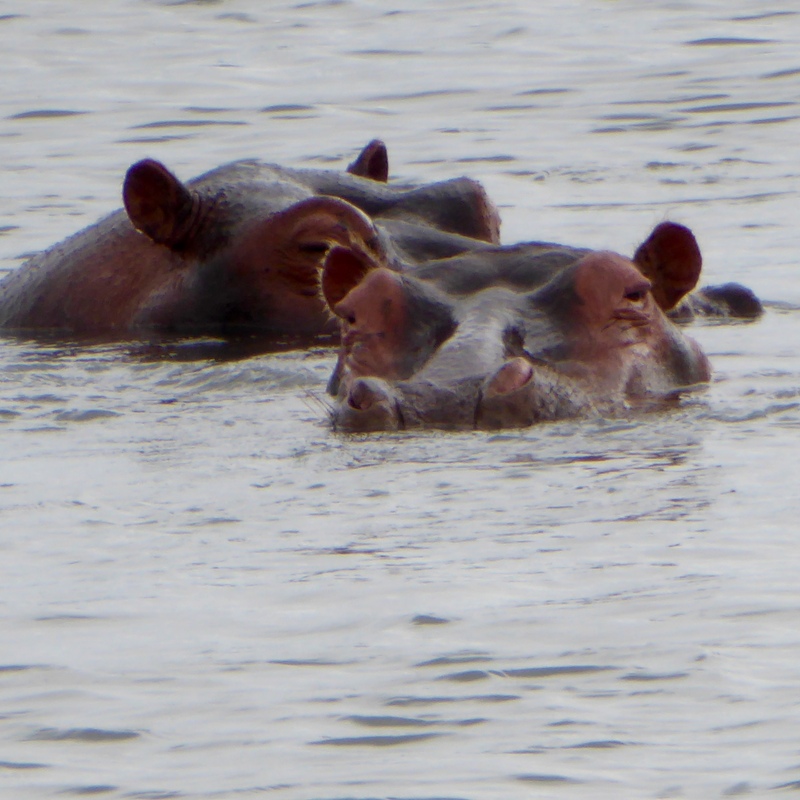 We see these hippos on the edge of the river. 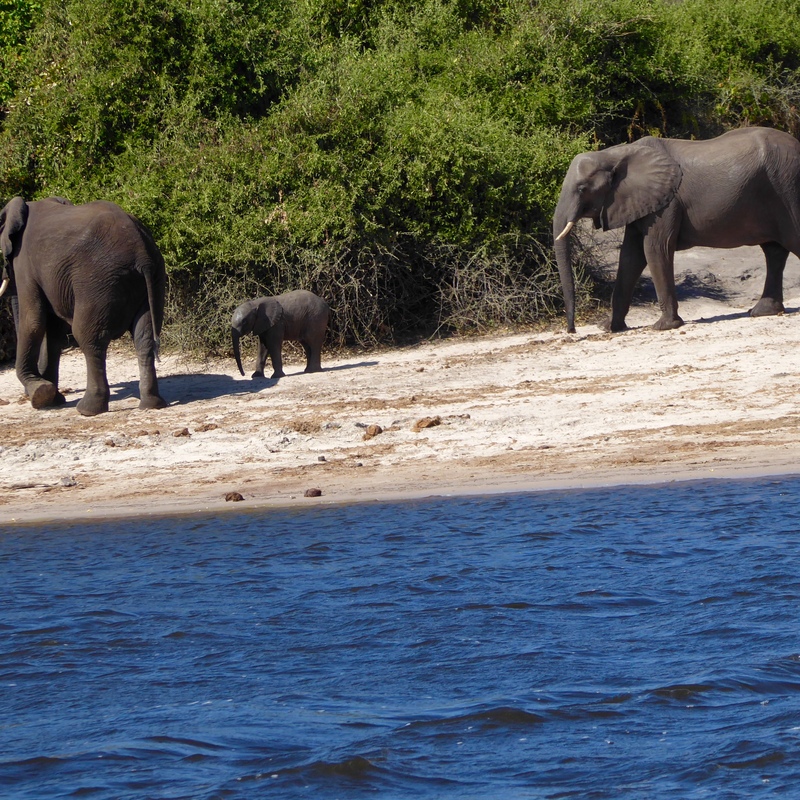 It is passing an elephant in the river! This is fantastic. 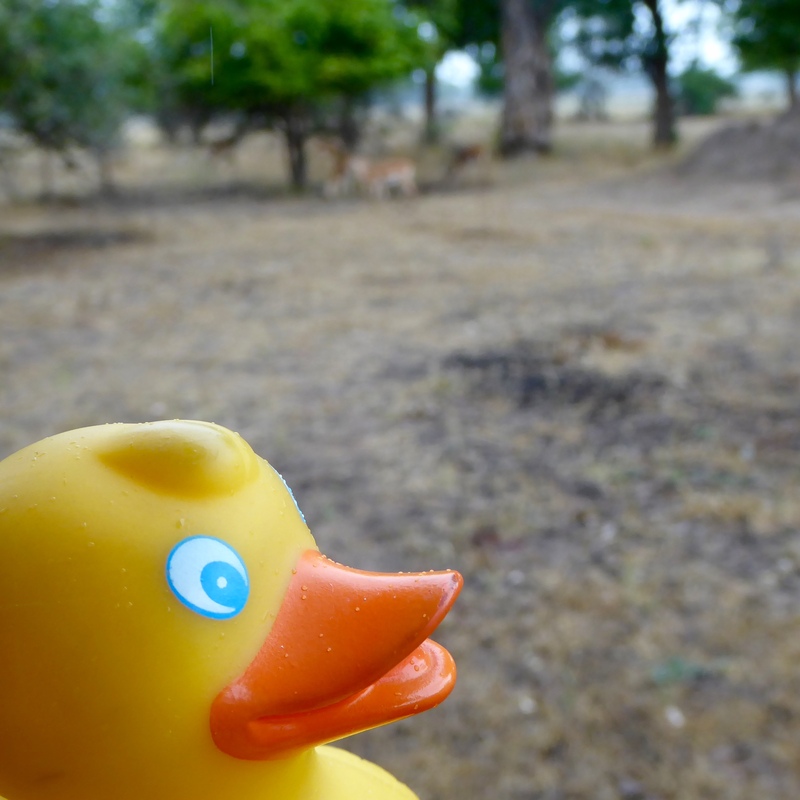 Today will the first safari for this Colorado Traveling Duck. Mom and two of the humans have been on safaris before, but I am so excited for my first time seeing the animals in the wild. 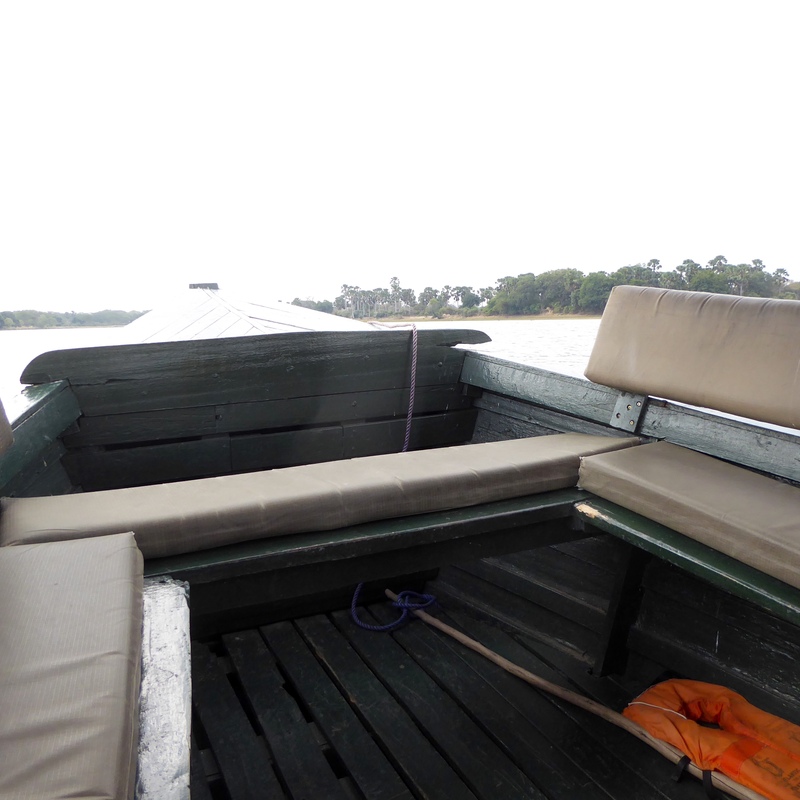 After getting settled in, we will go on a boat safari. We are on the Shire River, looking at a resort. 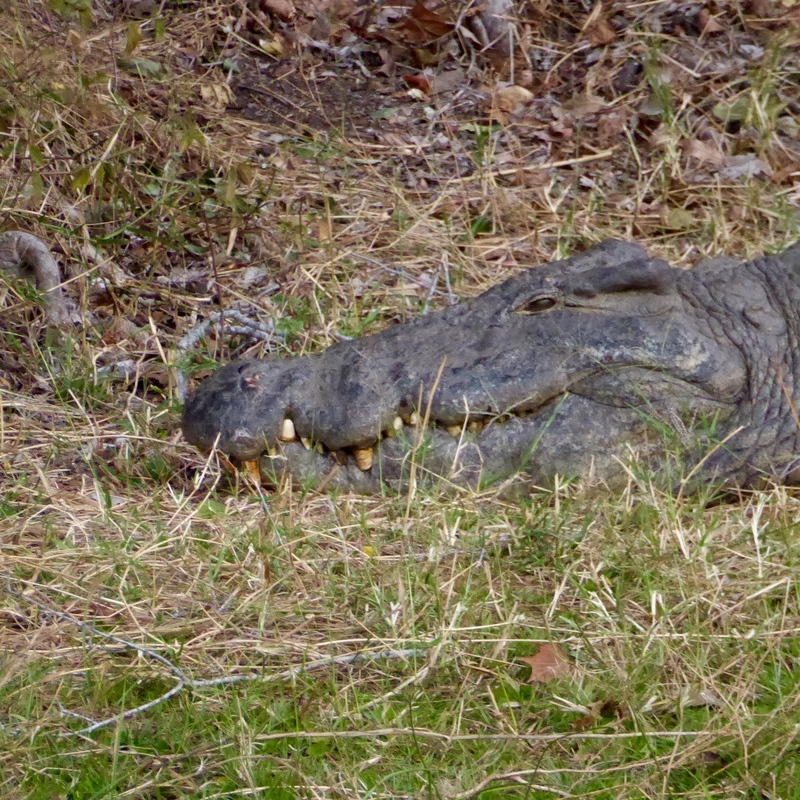 We passed several crocodiles, but check out the teeth on this one. Big teeth. And many of them. 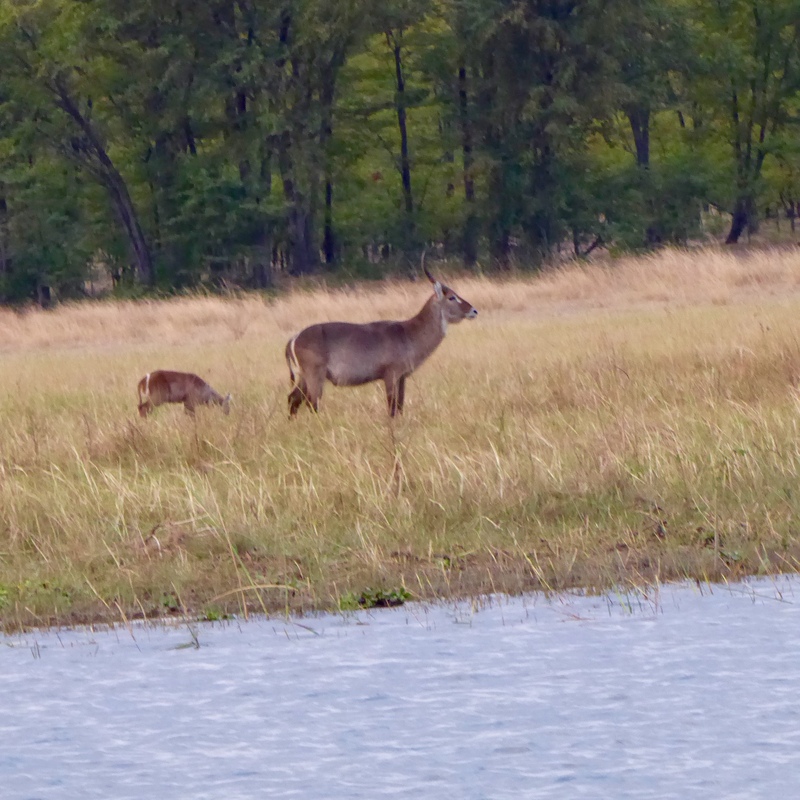 Several waterbuck are along the river; I like mom and child here. 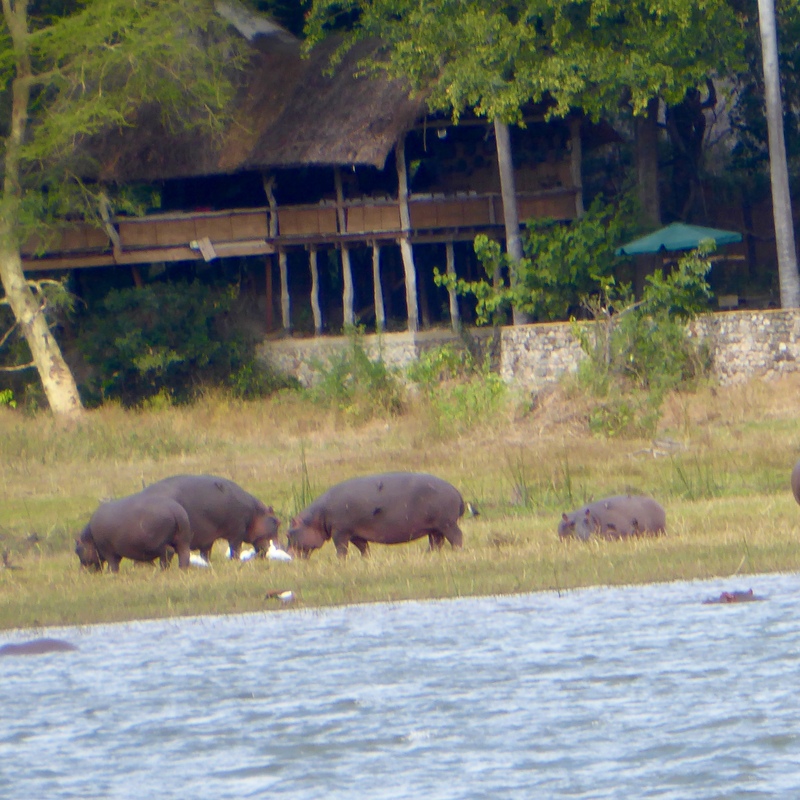 There are so many hippos here. They are really big! 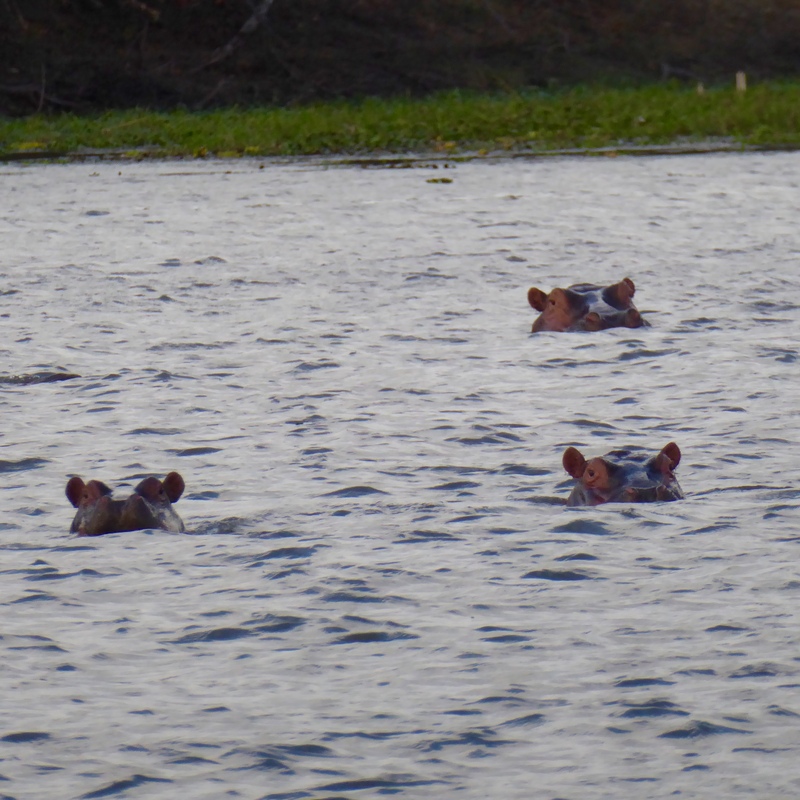 The hippos seem to prefer the water. I think these three, watching, must like us. 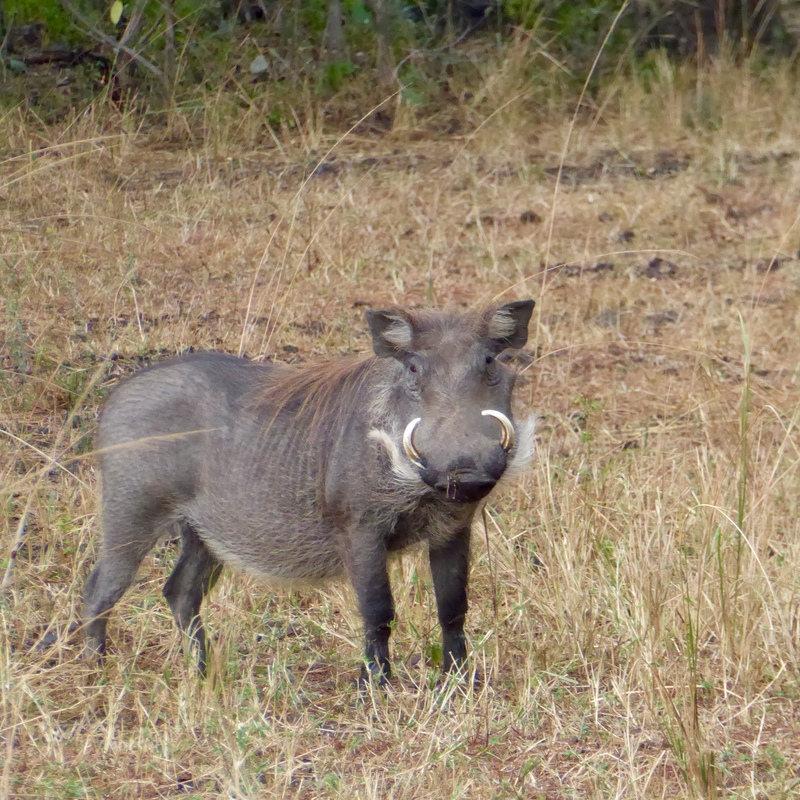 I like the warthogs. 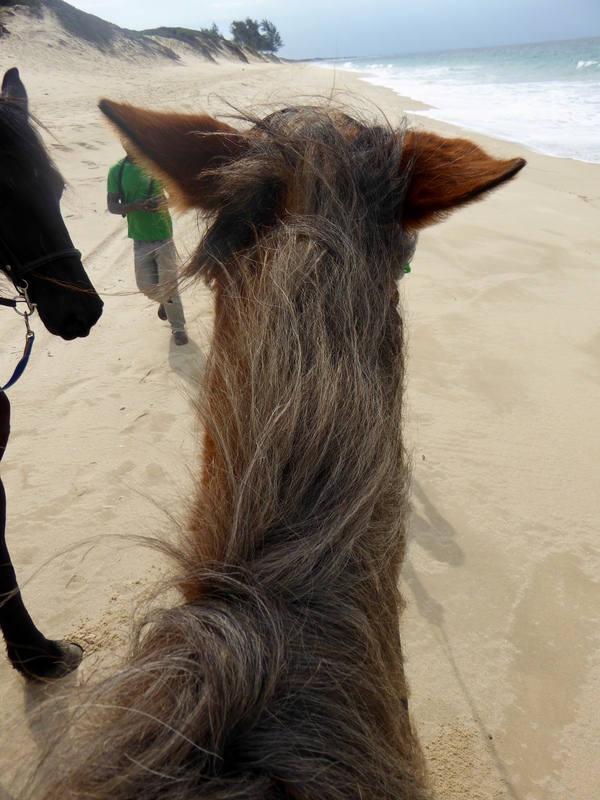 They have long shaggy hair on their neck and upper back. 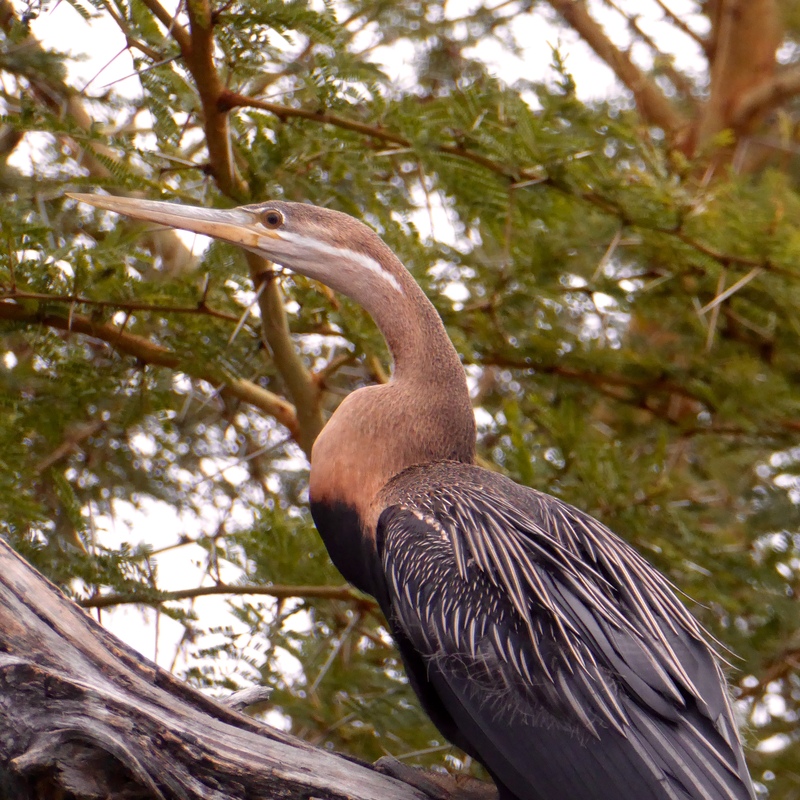 Our Bradt guidebook for Malawi, says Liwonde is one of the top sites for bird watching in Malawi. 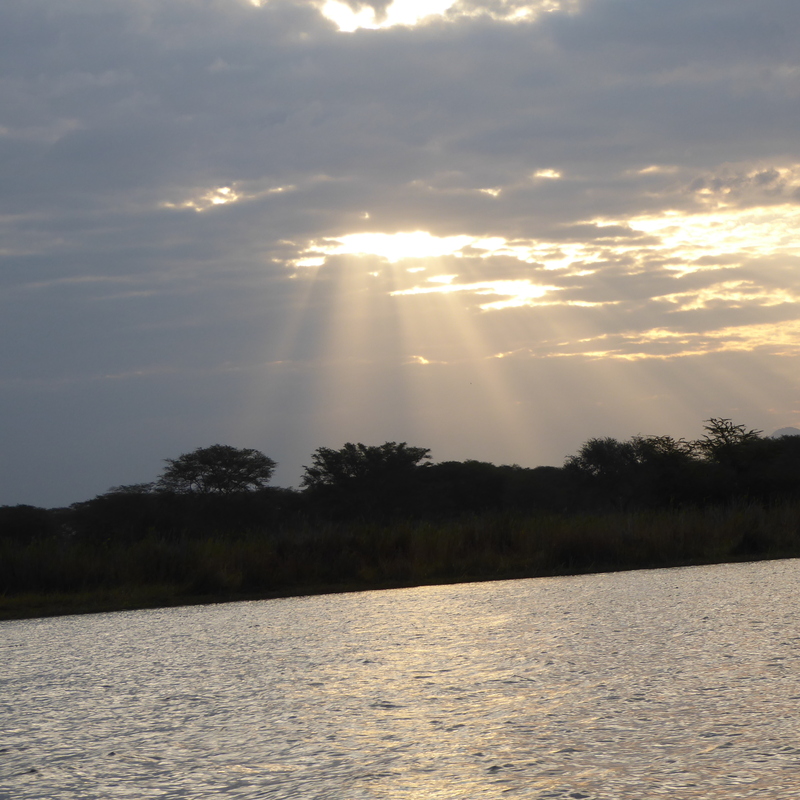 The book also says there are about 2,000 hippos along the river and several crocodiles. Some of the crocodiles are “terrifyingly large.” I believe the book. 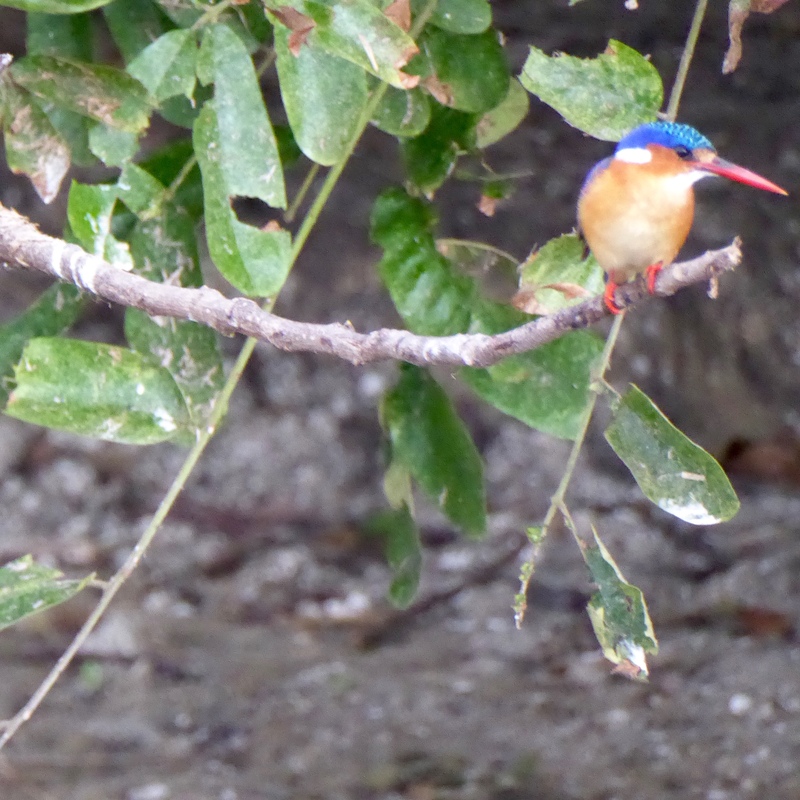 This bird has a beautiful bright blue head. 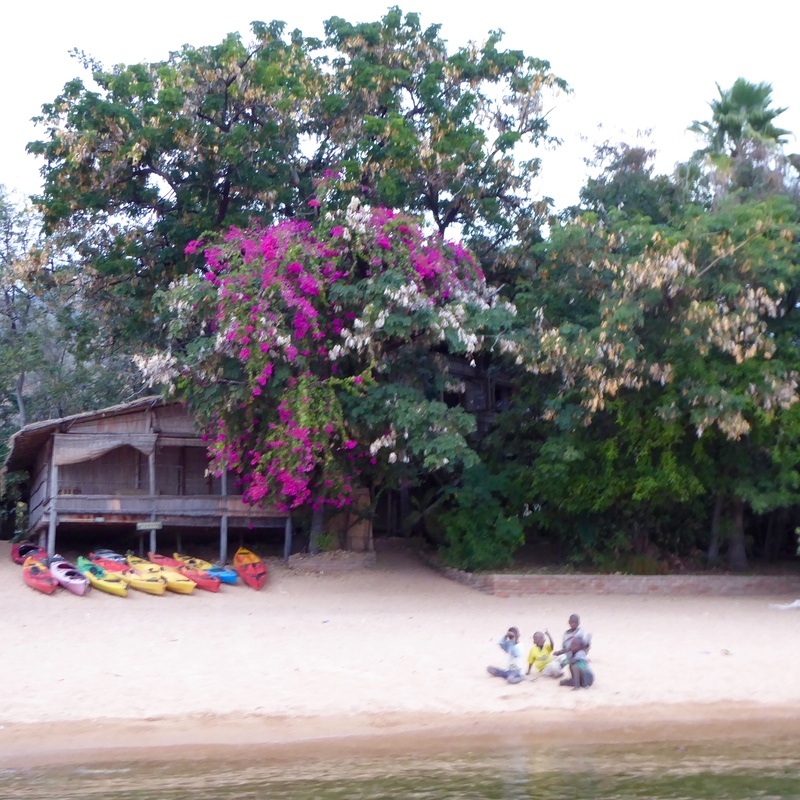 Here is a tree full of Malawian birds. There are so many, but I can’t post all the photos. The sun is getting lower and I like the way the sun’s rays come through the clouds. 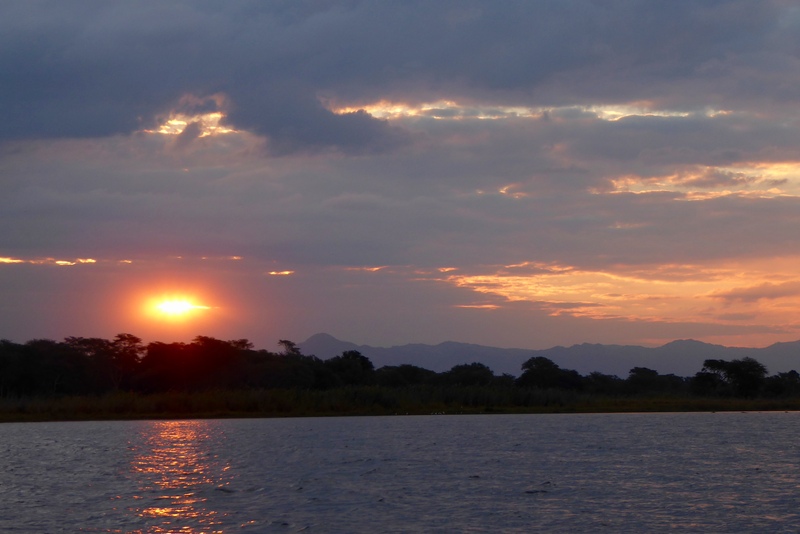 As the sun sets, we return to the lodge and our tents for the evening. 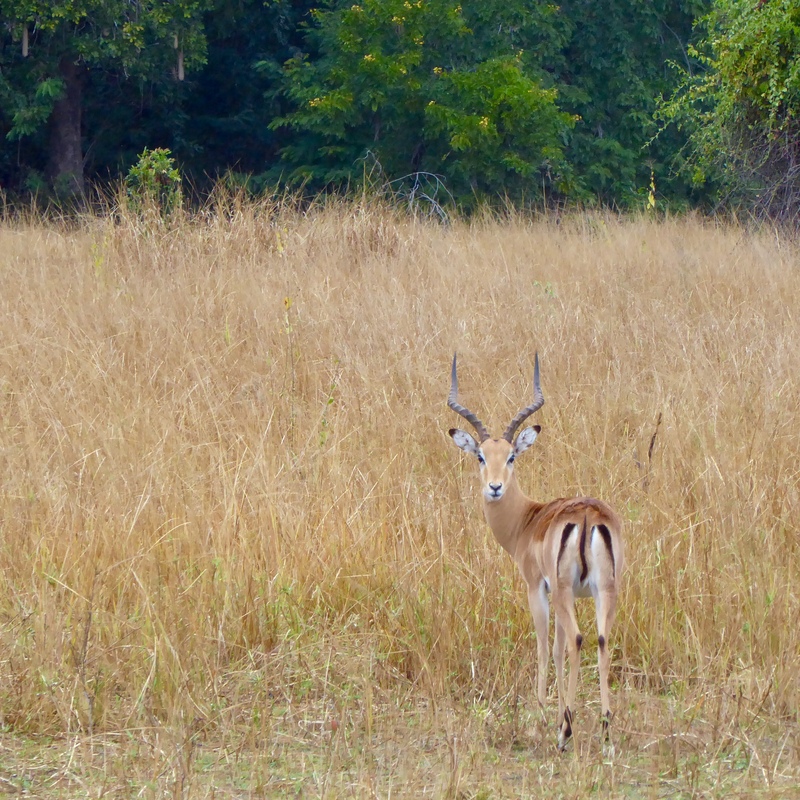 I know I am going to love safaris. 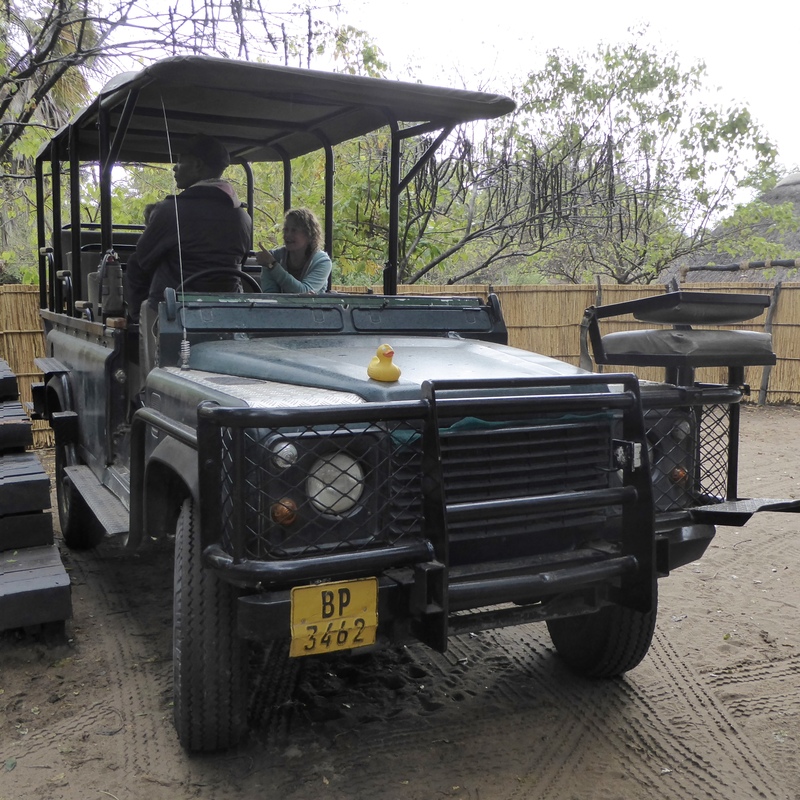 Tomorrow we will drive in a safari vehicle to look for more animals. This is a great African day.